A little under a week prior to the Freakin' Fast Marathon in Idaho, fire broke out in the Columbia River Gorge National Scenic area just east of Portland, Oregon. The wildfire, unfortunately started by teens who lit fireworks in the forest, spread to over 34,000 acres of pristine Pacific Northwest forest, long considered to be Oregon's "crown jewel," with North America's largest concentration of waterfalls, and home to 800 wildflower species. Smoke from the fire forced the evacuation of hundreds of homes on the eastern fringes of Portland's metro area, as well as cities downwind along the river. It, along with several other wildfires burning in the area, greatly affected air quality all throughout the northwest; in Idaho, air quality index (AQI) numbers were spiking into dangerous and unhealthy levels. 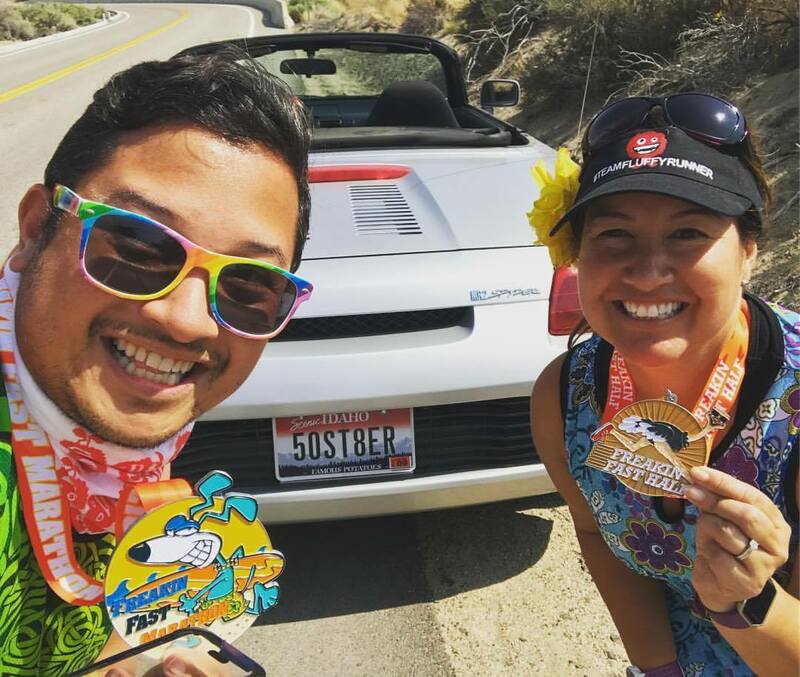 The Freakin Fast Marathon race director Wayne Ebenroth emailed participants to let them know that the race would still go on, as long as AQI numbers stayed under 200. On Wednesday, stations in Idaho City, Boise, Garden City, Meridian, and Nampa were elevated - not yet above 200, but very close. 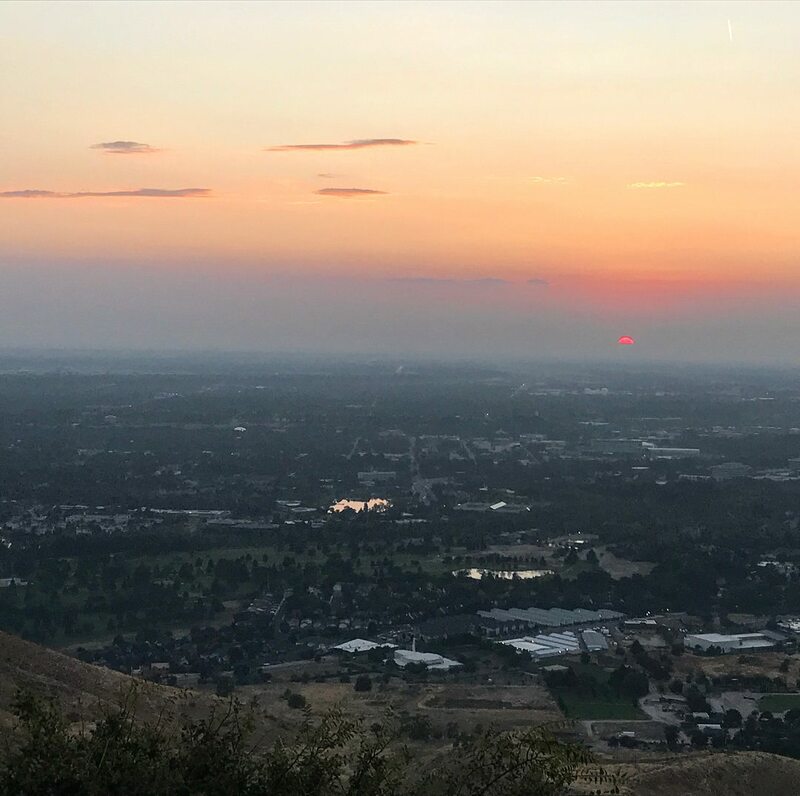 The following day, AQI forecast in Boise was at 175. On Idaho's DEQ site, Idaho City was listed at 181, Garden City at 95, Meridian at 181, and Nampa at 167. Those improved even further the following day, and by Friday evening, the forecast for Boise was an AQI of 108. So we were definitely on for Saturday. 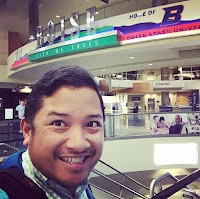 Arriving on the last flight into Boise! I left work in Jamaica at 4:15pm, and got to my gate at LaGuardia at 5:02pm. Very impressive, considering in all the commute time it take to get there, and pretty impressive for a Friday afternoon. My flight left New York only ten minutes late, and we even were wheels up much quicker than I would expect at LaGuardia. I connected in Denver, and grabbed dinner during my layover. 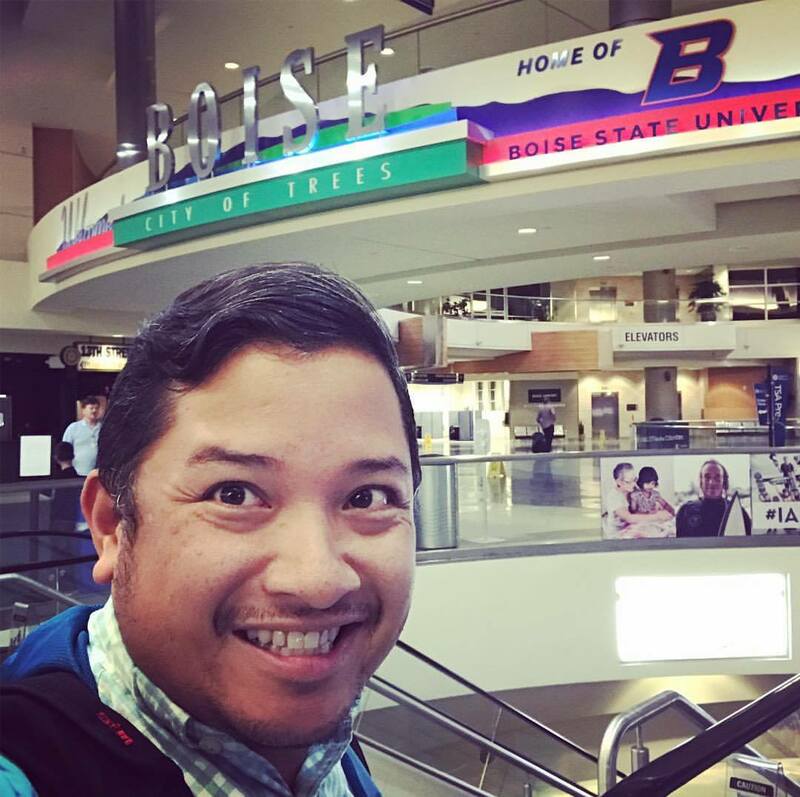 My flight took off at 10pm, and would be flying late into Boise, arriving at midnight. I pick up my car, and it's brand new - a 2018 Nissan Versa with only THREE miles on it. The counter agent tells me that it was delivered to the airport earlier that afternoon. I drive the 15 minutes to my friend Kimberlee's house in Boise's North End and went straight to bed, falling asleep around 1am, as she and her husband Eric were already fast asleep. I was getting up at 5am, as we were to get to Riverglen Junior High School to catch our shuttle buses to our respective starts at 6am. Early morning drive to the shuttles! Four hours later, I'm awake, and get myself dressed for the race. 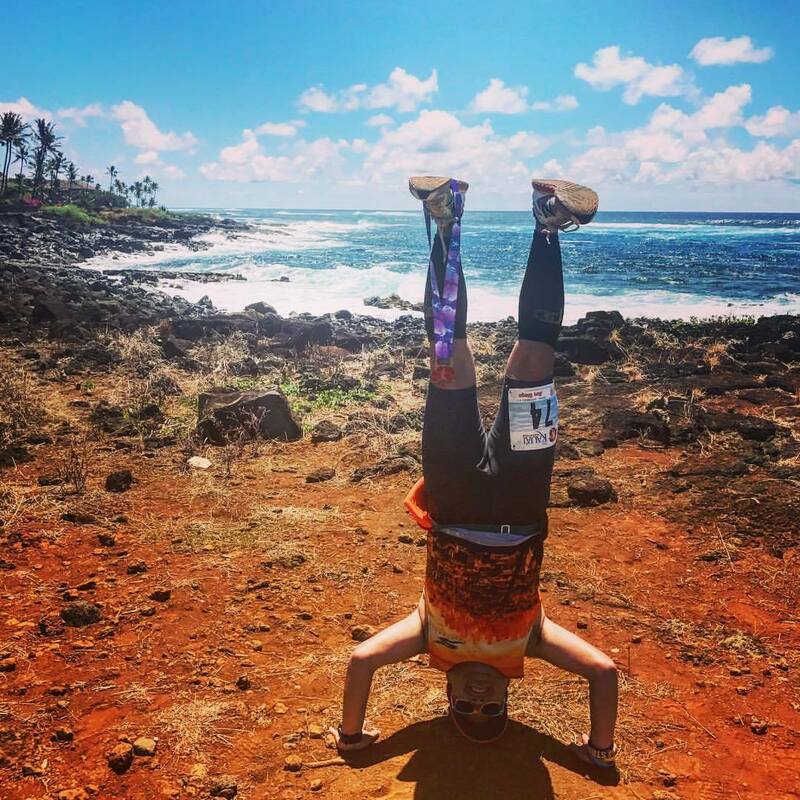 Kimberlee is running the half, a new distance for this September event, as the Freakin' Fast Marathon and Half Marathon are usually run separately. This year, there was a snafu with the buses during the half marathon held in July, so the race director decided to hold a last minute "make up" half, mainly for locals who didn't get to run the July event, as many were requested to help out with shuttling out-of-towners to the start of the half marathon when the buses didn't arrive. The shuttles were both leaving from Riverglen Junior High, only fifteen minutes away; with the shuttles for the full leaving at 6 and the half leaving fifteen minutes later at 6:15. We leave the house with more than enough time to spare, and even stop to get Kimberlee her Starbucks mobile order. 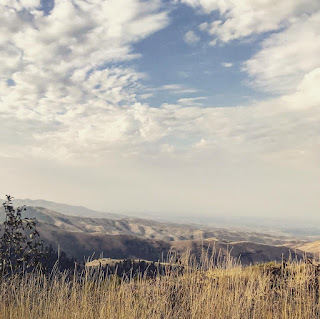 I get on the second bus that heads up the mountain, and end up falling asleep on the 50 minute ride up the mountain to the startline at the top of Bogus Basin. 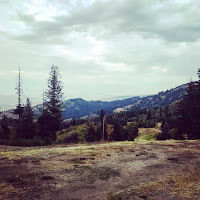 The startline is located at Pioneer Lodge, located mid-mountain from Shafer Butte in Bogus Basin Mountain Recreation Area, a popular skiing location up the mountain about ten miles (as the crow flies) northeast of the Boise city limits. The course would twist and turn along Bogus Basin Road, the road our buses took us up, a two-lane road that turns some 172 times. From the top of the mountain down to Boise, it loses 3,400 feet of elevation as the terrain changes from mountain forest to dry sagebrush foothills. 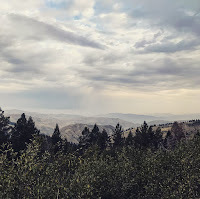 We arrived at the top, elevation 6,765 feet, and it was a bit breezy when we got off, definitely colder than when we boarded down at the junior high school in Boise. We still had about 40 minutes to go before the race start, and everyone was just milling about, waiting for other buses to arrive, and the line to the five or six port-a-potties was getting longer. There were less than 150 of us up there, but you know... runners gotta do what they gotta do before a race. I went over to one of the buildings, and sat on the floor of its shielded porch to get out of the chilling breeze, alongside a couple other Marathon Maniacs from out of town. Soon, Wayne came on the PA and made announcements, giving us the lowdown on where we'd start from and other immediate race logistics. It was all pretty informal, especially with the fact there were only some 120 or so of us doing the full marathon. We had chips on our bibs, but there was no real start mat - we were all going to start at the sound of the truck's horn that would head down the mountain in front of us, at "gun time." While we were to start at 7:20, we had about a ten minute delay with some of the last few people using the port-a-potties, and then I sang the national anthem to mark Idaho off my list. As soon as I finished, Wayne headed to the truck and coordinated his stop watch with the driver - and "HONK" - at 7:33am, we started off! In the shadow of Shafer Butte, we started down the mountain along the switchback approach, clocking in some gravity-aided first couple miles - my first two being a mind-boggling 8:14 and an 8:40, losing about 550 feet in elevation. With it being an informal race, there were no mile markers either, but the course was still well marked with cones and signage to show the direction in which we were to run. 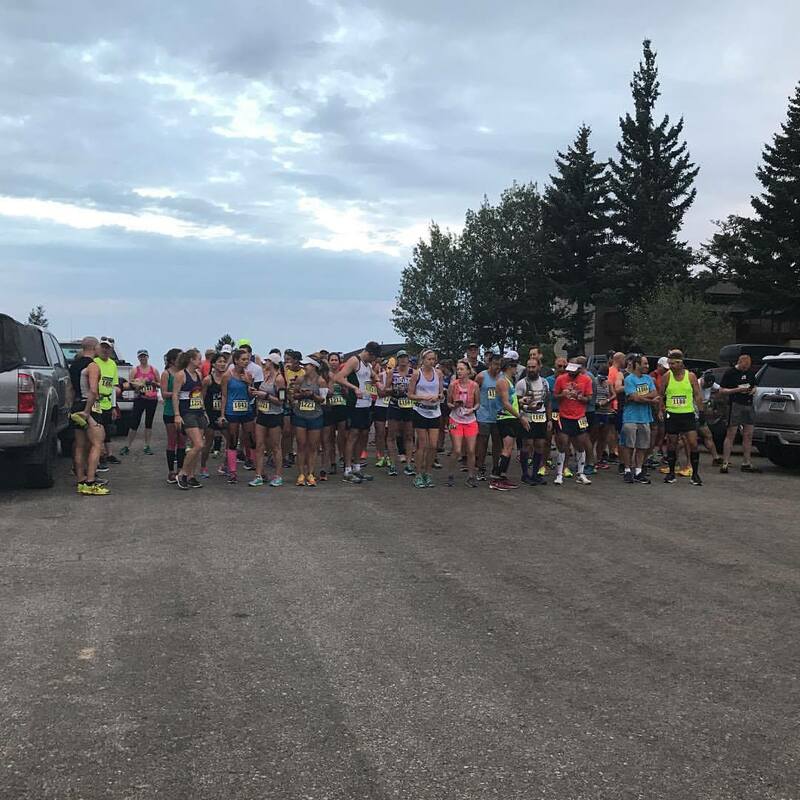 The road flattened out to another level of parking in front of the Frontier Point Lodge and Nordic Center, and we proceeded on an out and back of 3/4 miles in each direction, on loose gravel, with some fifty feet of elevation change rolling upward and downward. My third mile slowed down significantly, as I began to walk, especially after reaching the turnaround point. I had thought I was far behind the majority of the runners, as several folks passed me in the first two miles, but upon reaching the turnaround, there were still several behind me still on their way to the turnaround point - but gaining on me quickly. 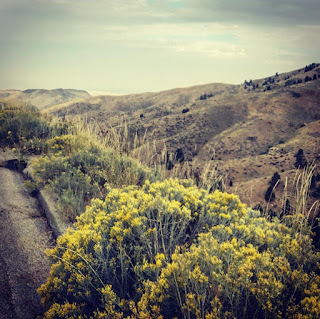 Despite my lack of oxygen, I continued onward, pausing to walk on and off over the next couple miles, as the road stayed even and actually rose a little bit over the next two miles. Whatever time I had gained by taking off at a blistering pace over the first two miles was eaten up by some slow 4th and 5th miles. Add to that - my stomach was in knots, probably from all the jostling caused by running downhill. After the 5 mile mark, we began to lose some elevation again, and my split time sped back up again, clocking in a 9:13 mile. 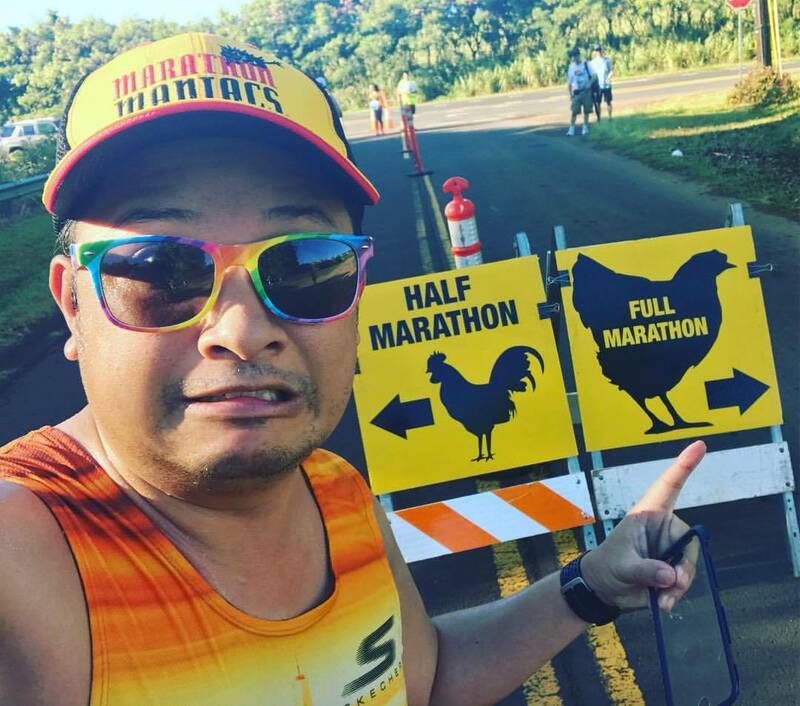 There were a set of port-a-potties at mile 6, but I continued on, thinking, let me get the first 10K in, some sports drink, and then I'll finally use the facilities. Thankfully, an aid station came up just as we approached mile 7, and I had a single port-a-potty available for my use. I lost about three minutes, but I emerged out of that sauna of a box feeling much better. And it made quite a bit of difference; mile 8 clocked in at 12:00, but that included my bathroom break - but I put the gas pedal on from then on. 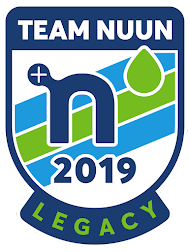 My next seven miles would be the fastest in my entire race - clocking in miles between 8:32 and 8:43, even stopping quickly during the aid stations for water/sports drink. I was catching up, and catching up BIG time. The scenery changed rather drastically from green mountain forest to desert as we continued to descend down the mountain. Coming into view far in the distance below was the city of Boise, shrouded by a hazy cloud of smoke from the wildfires that have plagued the western and mountain states for the last several weeks. 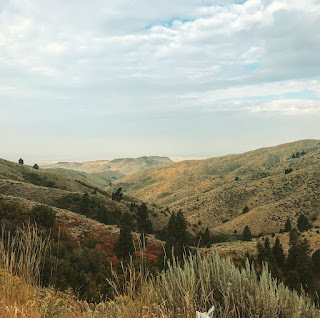 As we continued down the mountain, we moved from rural Boise County into Ada County, just as we also exited the Boise National Forest, near the 11 mile mark. We passed many a brand-new hillside mansion, obscuring the natural beauty of the landscape. Speeding down the mountain in the right lane, we also had several cars pass by in the other lane, led by a pilot vehicle leading them up and down the mountain and past the runners without impeding their forward momentum. 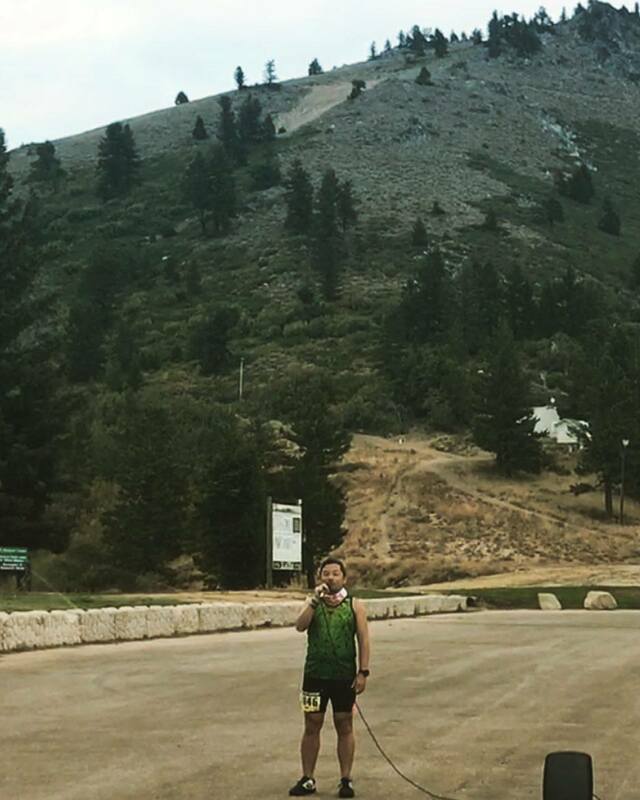 We reached the halfway point of the race at 4,062 feet of elevation, and I posted an approximately 2:04:43 first half, one of my fastest half marathon times in quite some time. Considering I had a three minute port-a-potty stop and it wasn't ALL downhill, I could've pushed even closer to the elusive sub-2 hour half. From the start to this point of the race, we had lost 2,703 feet of elevation. 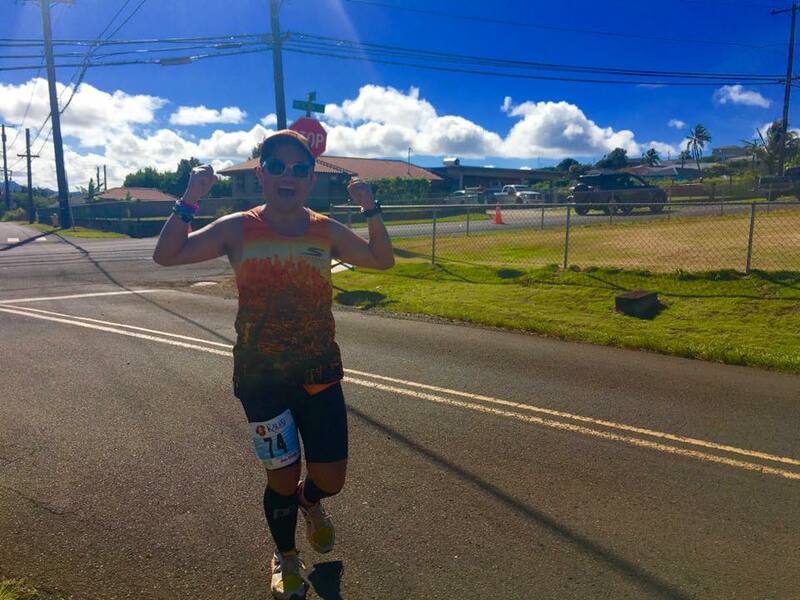 My speed continued well past the halfway point, clocking sub-9 minute miles for mile 14 and mile 15, when I finally took my first GU of the race. 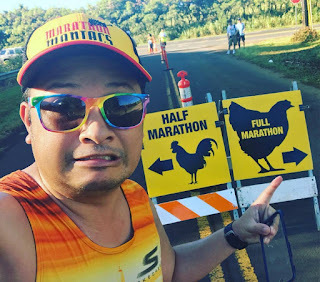 I had caught up to some of the back-of-the-pack runners of the half marathon, and even passed some marathoners who had passed me when I took my bathroom break. Then, all of a sudden, mile 15.5, and I face my first uphill battle in over nine miles. 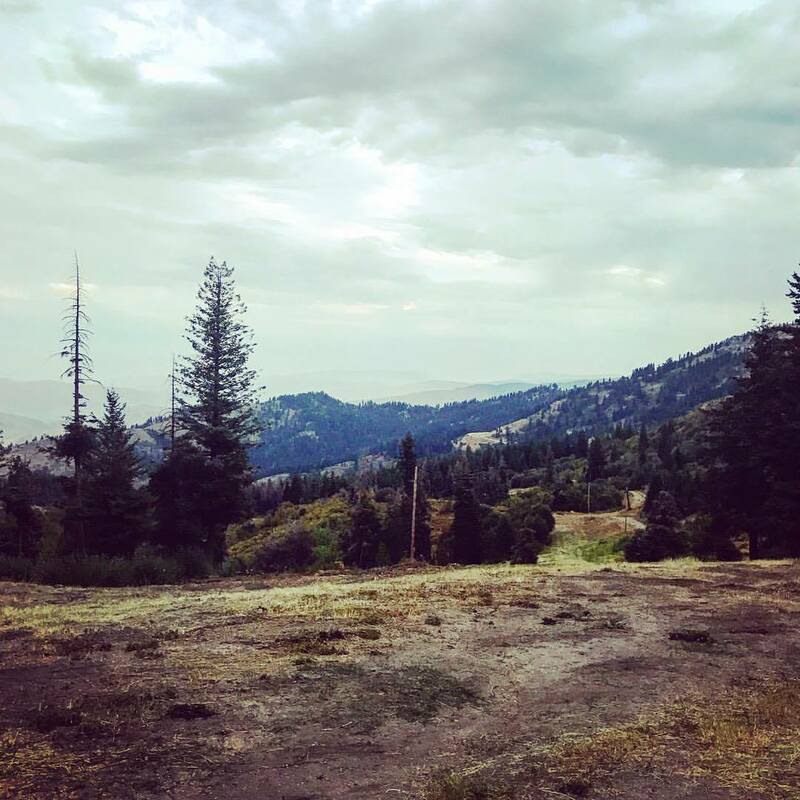 It was minimal - a hill of only 65 feet of climb, but still enough to force me to take a real walk break, something I had stopped really doing other than at the aid stations since the extreme downhill section started. My mile 16 split was a 10:27. Fortunately, the hill was only about 1/4 mile, and was followed with a nice stretch of downhill, but another two hills followed, so my mile split for the 17th mile crested over 11 minutes. That mile was NOT "freakin' fast." Two more downhill miles followed before it flattened out significantly as we entered Boise city limits. The scenery changed abruptly to sprawling single family homes along the foothills of Bogus Basin, in the Highlands neighborhood of Boise. Here was where we first encountered some of the course marshals volunteering during the race to direct car traffic going up and down the mountain; and the half marathon also split off to the left to finish their race just off of Bogus Basin Road in the parking lot of Highlands Elementary School. Of course, we marathoners were just about to hit the 19 mile mark of the race (and this last bit of downhill got me to return to a strong 9:10 mile split), just as we continued on past Simplot Hill, where the former mansion of potato magnate J.R. Simplot once stood - instead, a massive American flag waved in the breeze. Another mile down the Bogus Basin Road was left, and the last bit of downhill before we made our first right turn since early on in the race, onto Hill Road. The scenery changes, houses along the road. And this amazing photo with the clouds and sun. By now we were past three hours into the race, and it was bright and sunny at 10:45am. 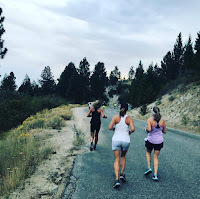 As the sun continued to beat down on us, we entered the "flat" section of the course, which, on tired and downhill-beaten legs 20 miles in reduced me to run-walk intervals solely based on landmarks rather than actual run time. Hitting the wall was a factor here, mainly because the temperature made it tough. 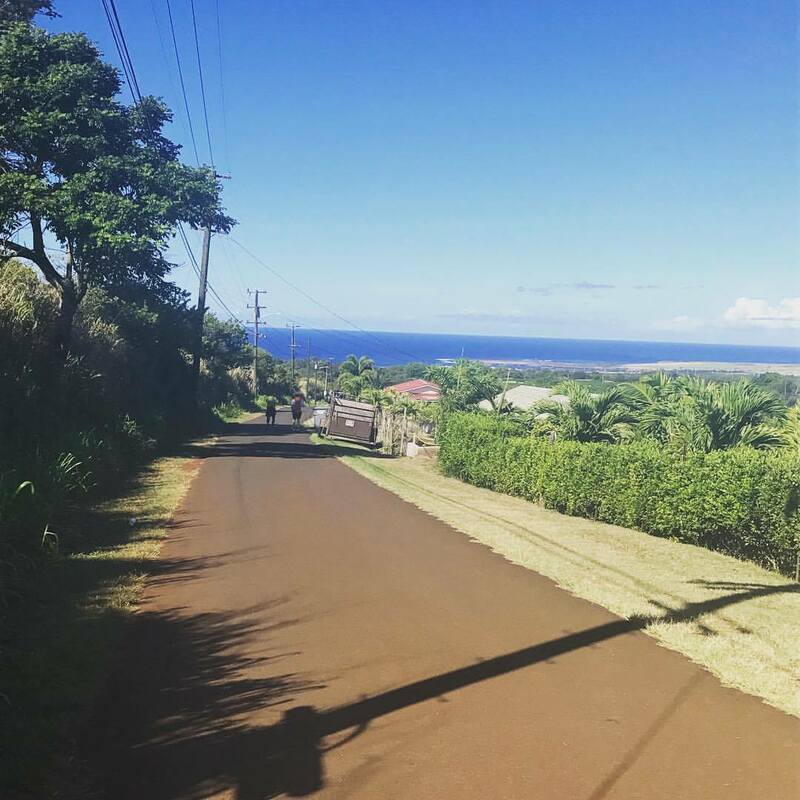 Some runners had gone up onto the sidewalk, but I continued to use the asphalt to my advantage, using its slight cushion on my knees as I progressed forward. 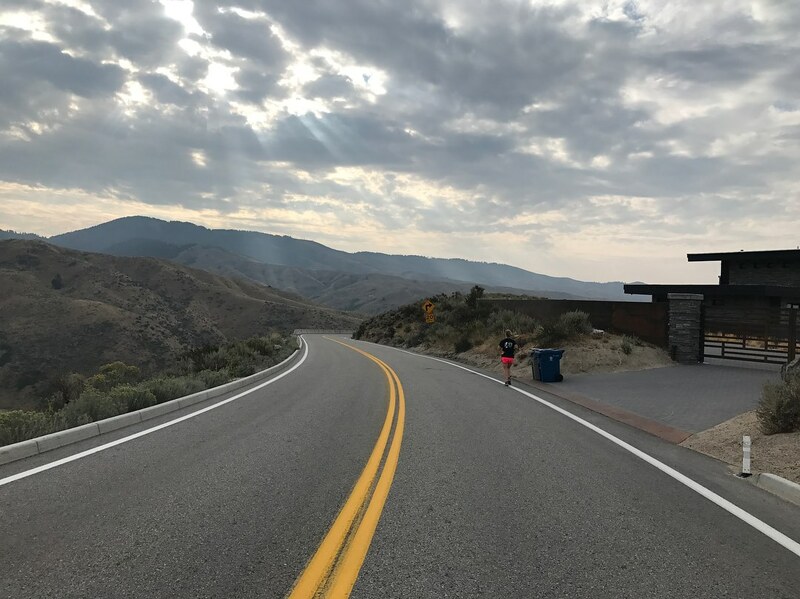 I continued to pass other marathoners as we made our way northwestward along Hill Road, a long 2 3/4 mile stretch before we turned left onto N. Collister Drive. My mile splits dropped significantly, but I knew I was well under my PR, based on the fact that I had banked so much time in the first half of my race, and well into the second half, too. Just how much time, though, depended on how fast I'd make my closing miles. We reached the 23 mile mark along Collister Drive, which was a short one mile section before we turned right into a residential street. Here, I managed to pass several more marathoners, who were taking advantage of the first shade trees to cool us down in quite sometime. 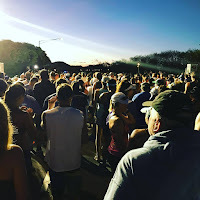 A large group of marathoners began to walk as we approached an aid station at the 24 mile mark near the baseball park, but I carried on, knowing that as long as I stayed below 12 minute miles, I'd go under 4:30 and have a VERY strong PR in my hands. 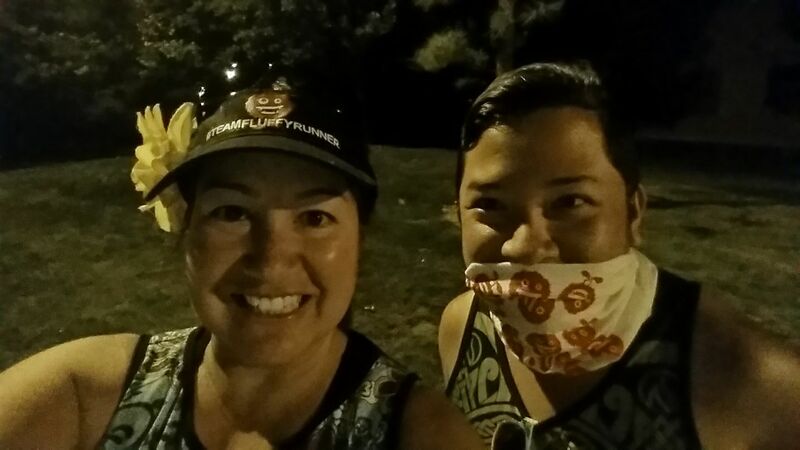 From mile 24 at Elmer Street, to where we turned right onto Pierce Park Lane, I just continued to surge on. 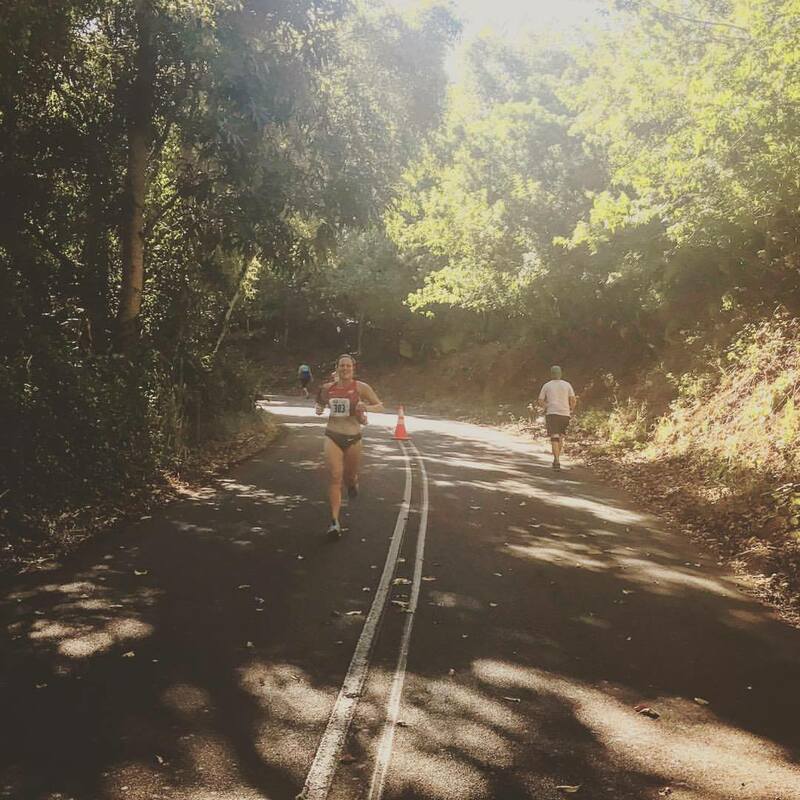 I was pretty much alone as I ran northward on Pierce Park Lane, a mile where I chose to reflect back on the fact I had run a very strong race, and I just needed another twenty minutes to finish strong. Along the way, a car passed by cheering me on by name, and I noticed it was Kimberlee with a car full of passengers making their way from the half marathon finish to the marathon finish! 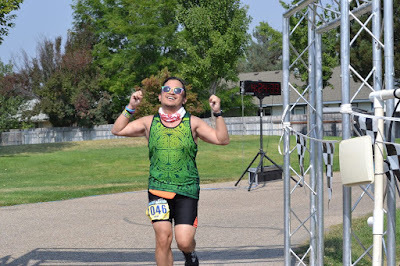 I had told her before the race that I was aiming for a 4:30-5:00 finish, but at that point in time, I was bound to get to the finish line even before that projection! 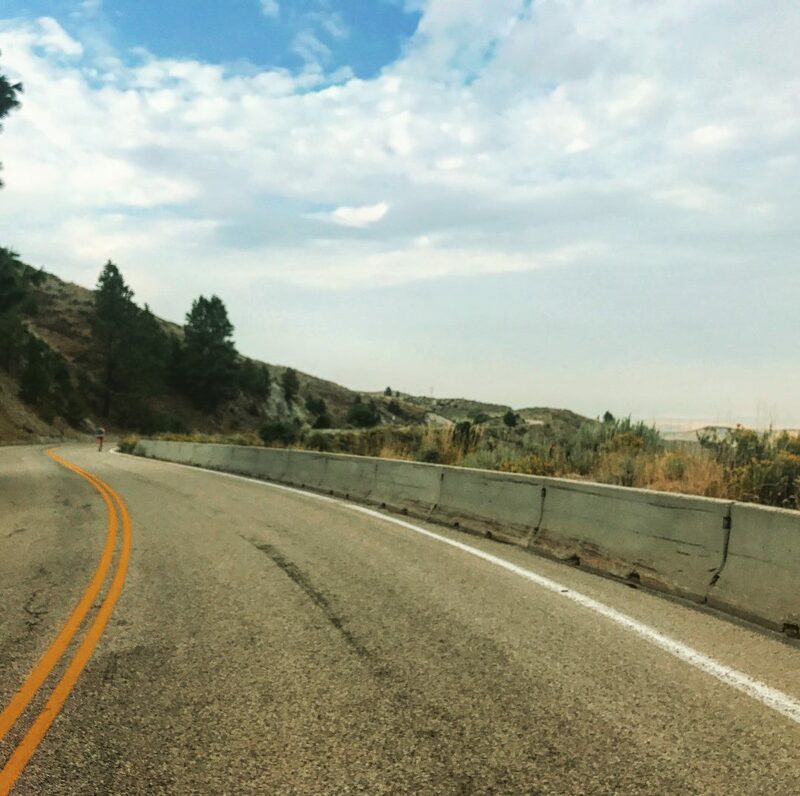 We re-emerged back onto Hill Road, turning left and encountering our last big hill, before I looked down at my watch and saw that I was approaching 4:20 with a little over half a mile left to go. This was going to be a BIG PR. I have to say, at the beginning of this year, I set a quiet goal to break 4:30 in the marathon. My PR for the last two years was set at Rock n Roll San Antonio in December of 2015, a time of 4:37:21. I had never really told anyone that I had that goal, it was just in the back of my mind since I had two stellar marathon finishes to end 2016, just off my PR by about 1-2 minutes. Most of my marathons finish in the 5 hour range- I'm usually quite thrilled if I get under 5. But the fact that I was going to eclipse it by as much as ten minutes... I was more than thrilled. With my legs going strongly under me, I crossed the street and made my way for the last push turning left onto Gary Lane, and I could see the cones leading into the parking lot of Riverglen Junior High School not too far in the distance. Before long, I was there, and at the right turn, I could see the finish line. Kimberlee yelled out for me, and I yelled back... "I'm going to PR!" To a barrage of cheers, I passed the timeclock, displaying 4:24:50... which we would later find out was off by just over two minutes. I crossed the timing mat at the finish and I had a new PR... just what that was, I'd have to wait a little bit to find out. 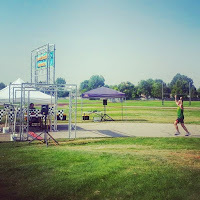 I had run a 4:27:00 flat. I PR'd by 10 minutes and 21 seconds at my 47th lifetime marathon, and even crazier... my 23rd marathon OF THE YEAR. 50 ST8ERs with our finisher medals! I was exhausted, but more than thrilled by this result. 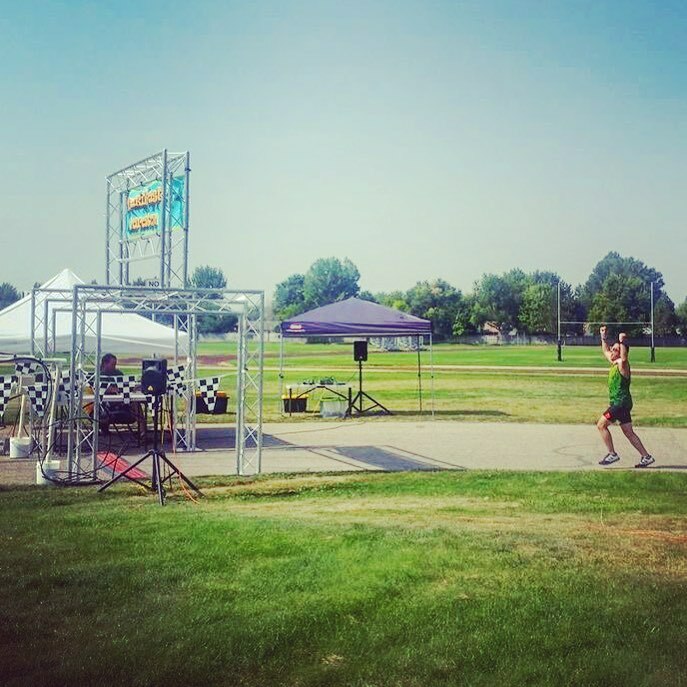 I didn't go in with the mindset that I would PR; I just knew I had the capability if I kept my mile splits in check. I didn't know that I could push my splits as fast as I could, managing consecutive miles well under 9 minutes apiece. After some orange juice and shade, I got my legs massaged by the onsite massage therapist, before heading back to Kimberlee's place to meet up with her; she had left a little earlier to help out the marathoners still out on the course, as the temperatures had soared well into the mid-80s by that point, nearly 20 degrees warmer than at the start. We set out for our victory meal, riding together in her convertible back up the mountain to take my customary headstand photo before going to Highlands Hollow Brewhouse for a much needed late lunch. I ran from here down to here! We returned back to her house so we could finally shower away the sweat from the day, and also met up with her husband Eric, who had just returned from a long bike ride himself, before heading back out to experience more of Boise for the night. 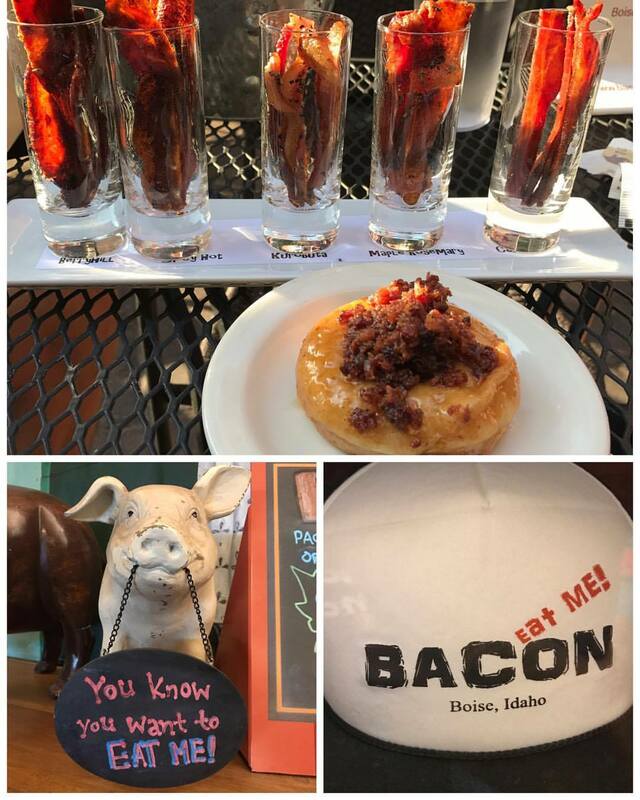 We hit up the Hyde Park Historic District also in the North End, where at Hyde Park Pub, I grabbed a beer and got to try out Idaho-style finger steaks, a Boise-centric food item consisting of 2-3" long strips of steak battered with flour and deep-fried. We also then headed into the downtown area, parking on the campus of Boise State University before going to the Boise Art Museum's annual Art in the Park, an open-air festival held every year on the weekend following Labor Day in Julia Davis Park, where visitors of all ages and interests can view and purchase arts and crafts from 250 artisans. 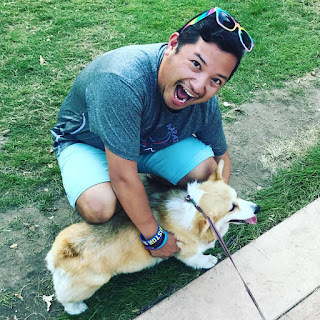 I even spotted a corgi in the park! 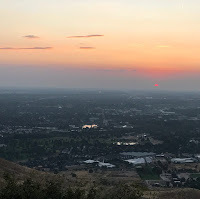 As the sun began to set, we hit up one more spot to check out the sunset... and set it did, quickly... we headed right back up to the Boise Mountains, this time going to the top of Table Rock, a mountain pillar located southeast of downtown Boise. It's a prominent landmark offering panoramic views of the Treasure Valley and Owyhee Mountains, as well as the Boise Foothills where it sits. It was still hazy from wildfire smoke, but the sun illuminated the dusky sky a neon pink, as it quickly set over the horizon. We closed out this eventful Saturday going through the drive thru of Westside Diner, near Kimberlee and Eric's home, to pick up an Idaho Ice Cream Potato - vanilla ice cream, dipped in cocoa to resemble a baked potato, with the requisite whipped cream and chocolate syrup on top. I slept soundly that evening! 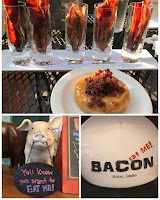 The following morning, we headed back to downtown to grab food at BACON (holy cow, bacon flight!) and then meet up with some friends of Kimberlee and Eric around the corner at Alia's Coffeehouse for breakfast. We walked around the alluring "Freak Alley" area of Downtown Boise, the largest outdoor gallery in the Northwest and a Boise institution since 2002. It began with a painting of a single alley doorway and now extends from the alley itself to a gravel parking lot. 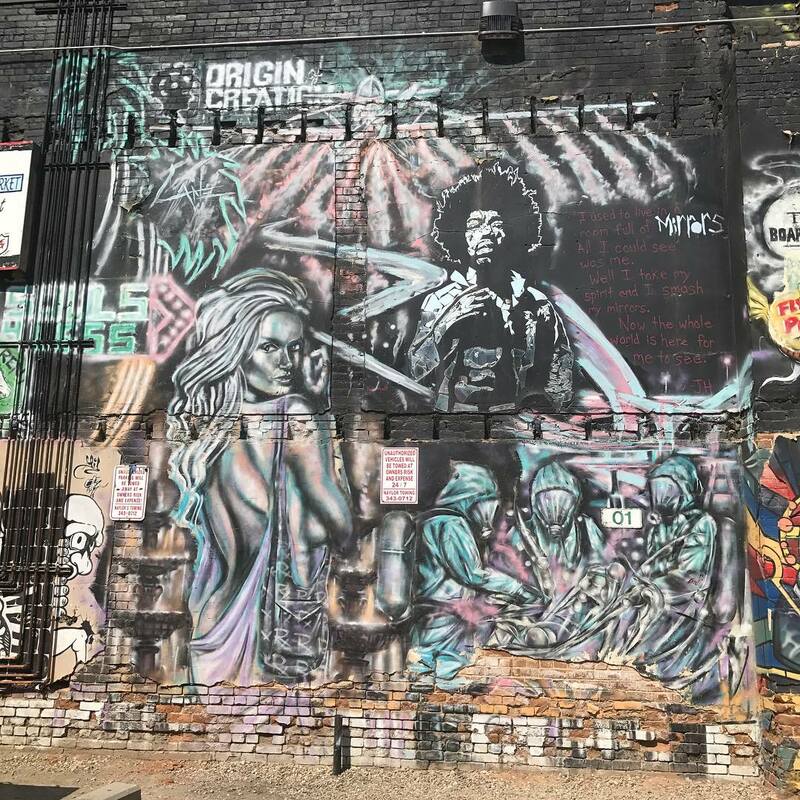 Murals are painted over and replaced by new murals (or incorporated into them) every two years; collectively it is the work of more than 200 artists. 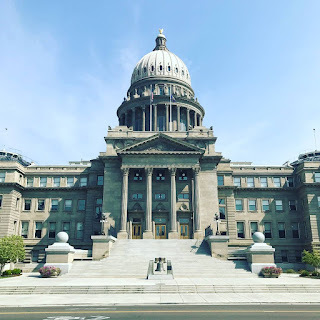 We then stopped over at the nearby Idaho Capitol building before heading back to the house for me to grab my stuff and head to the airport for my 2:30 flight. I headed home happy, with a new PR in my pocket. 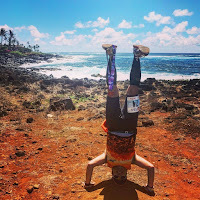 When figuring out my plans to get to Hawaii for the Kauai Marathon, I researched long and hard about flight departures and arrivals, specifically to minimize the amount of days off as well as consider an arrival in Hawaii in the morning. I determined that apparently there is only ONE westbound redeye flight from the mainland US to anywhere in Hawaii - a flight from LAS to HNL on Hawaiian Airlines. 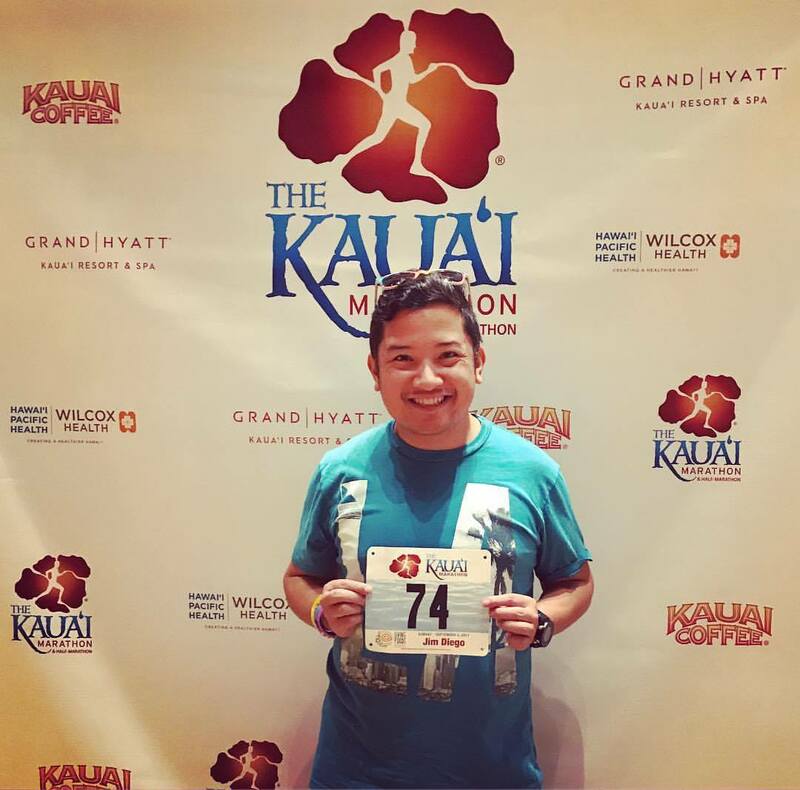 Apparently, because Hawai'ians are absolutely NUTS about Las Vegas, especially since there are no casinos in the islands, as Hawaii is one of two states with no legalized gambling laws of any kind (the other is Utah). So, they need to have a way to gamble and drink all day and then go home at night. 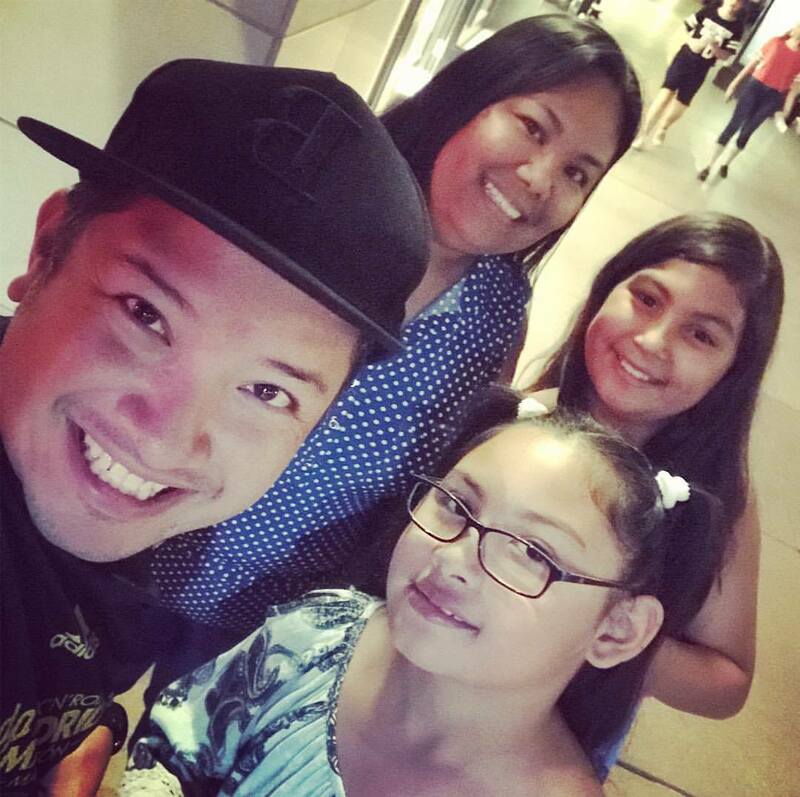 Family time for a short stop in Vegas! 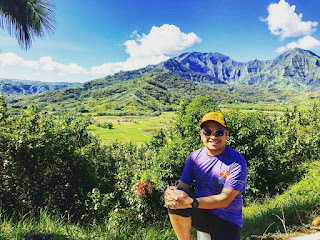 I had a very complex itinerary for flying out to Hawaii, using three different airlines I booked a one way Delta flight after work from JFK to Las Vegas, then did a multi-stop itinerary on Hawaiian from Las Vegas to Honolulu, connecting on to Kauai, and then my return from Kauai to Honolulu. My return flight to the mainland was on United from Honolulu to Newark on points. I had a lengthy six hour layover in Las Vegas, so I made plans to meet up with my cousin Erika and her daughters Alma and Amira for dinner before flying out. At 11:15pm, I was back in the Vegas airport waiting to check in for my flight, as there would be no Hawaiian Airlines counter agents until that time. After checking in, I headed to the very tucked away Club at LAS with my Priority Pass Select membership. I didn't spend a whole bunch of time there, as it didn't offer much and it was super small. I decided to try out a slot machine, putting in $10 just for fun, and after a couple pulls of the lever, I ended up being VERY lucky, winning $100! Soon, we were ready to board our SUPER late night flight, a 1:55am departure. I had status matched my Delta Platinum status to Hawaiian two weeks earlier (it was very easy, just a matter of emailing their customer service desk), and became a Pualani Platinum elite, valid until February 2019. One of the benefits of this level of Hawaiian elite status is getting two one way upgrades to first class on North America to Hawaii (and vice versa) flights, so I was able to use this on my flight on this leg. Additionally, complimentary First Class upgrades are available on the day of departure for "Neighbor Islands" subject to availability, so I was able to upgrade to the short-haul first class on the 20 minute flight to Kauai. But Hawaiian First on inter-island flights is basically just a "nicer" seat - no extra perks than economy. We got in super early to Honolulu (4:30am) and I transferred to inter-island terminal by wiki-wiki shuttle. At that hour of the morning, I was very surprised to see how busy the terminal was. 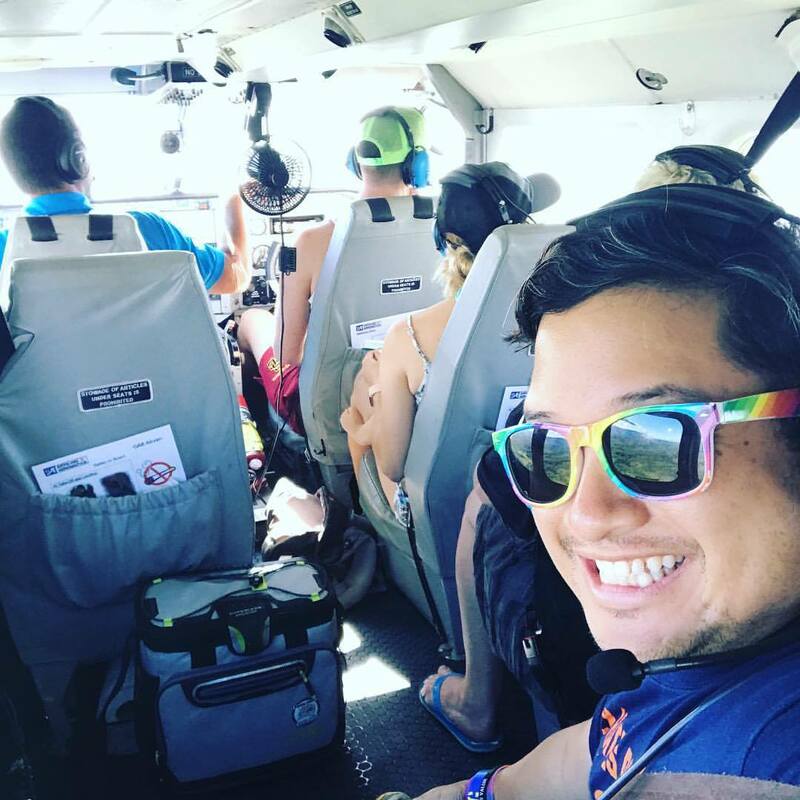 With Kauai flights leaving every hour, I actually was able to move to an earlier flight than what I was originally ticketed, with no charges and still in first. We departed Honolulu just as the sun was rising, with beautiful views of the sunrise over Diamond Head. I tried to take pictures of this beautiful view, but they end up sucking because the windows of the plane are so dirty. We land in Kauai 30 minutes later, and I pick up my car and head to Kamika's house to drop my bags off. Kamika was actually in California at the time of my arrival, to run the Disney races happening that weekend, but he would return while I was still in town. 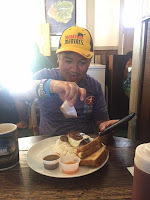 I decide to meet up with my friend Lisa from Florida, also in town for the Kauai race, for breakfast at Kountry Kitchen, where I end up gorging myself on a MASSIVE macadamia nut pancake, some delectable Portuguese sausage and hash browns. 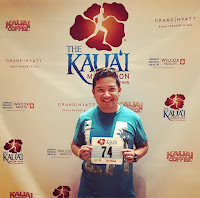 Later that morning, I head to the expo at the Grand Hyatt Kauai Resort & Spa in Po'ipu, pick up my bib, and also meet race director Bob Craver and race publicist/spokeswoman Robin Jumper. I also decide to purchase some race merchandise, including a polyester polo shirt, complete with the orchid design on it, which I hope to race in some temperate climates during the spring and fall. While at the expo, I ended up meeting two other runners from New York, Julio and Charin, after seeing their NYRR race shirts! 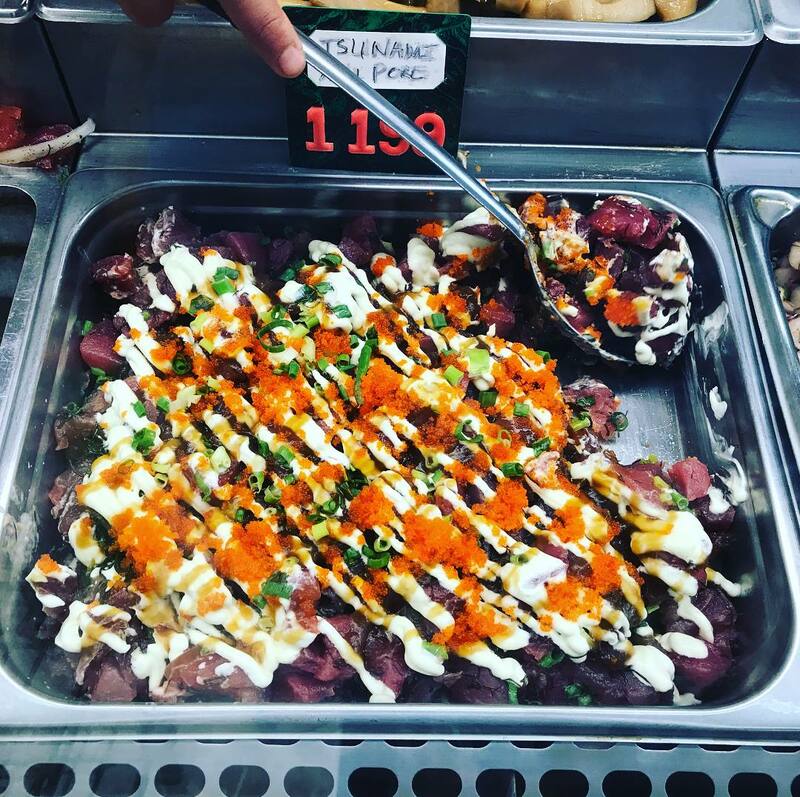 Gimme more of that delicious poke! 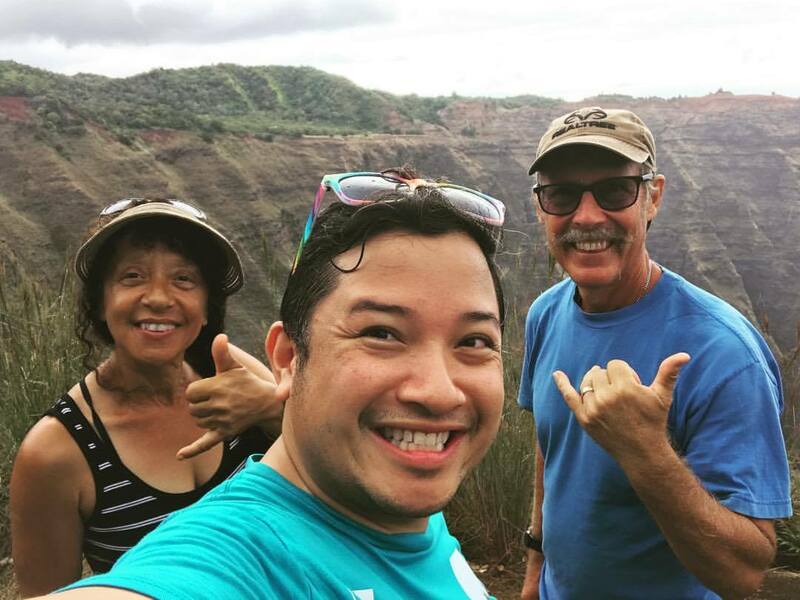 After getting all I needed at the expo, I decided to begin my real touristic part of my trip, heading out to Kauai's most visited landmark, Waimea Canyon. 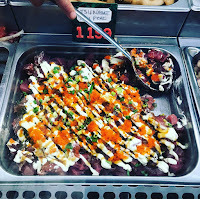 But before then, I stopped at Ishihara Market in the town of Waimea, as recommended by many friends to do before hitting up Waimea, for a deli-style selection of fresh poke. 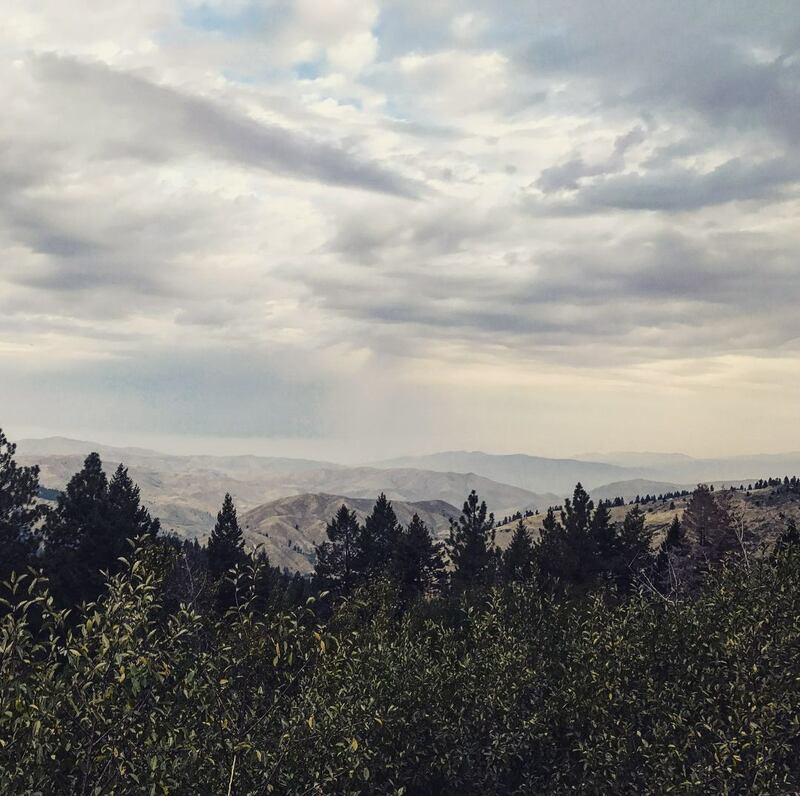 The drive up the canyon was absolutely beautiful, and definitely increasing in elevation, and greatly changing in scenery. As I was warned by friends, the weather on the island can change on a dime, and it's notable for its prolonged periods of rain, being one of the wettest places on earth. At one point during the drive, the weather dramatically changed, the clouds rolled in, and we experienced a massive DOWNPOUR. 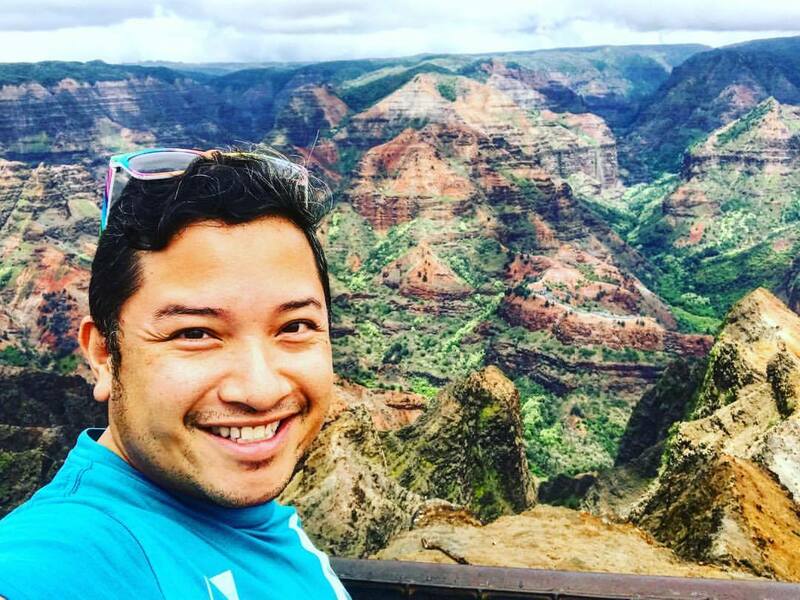 The lookout at Waimea Canyon is absolutely beautiful. There's a reason why it's called "The Grand Canyon of the Pacific." 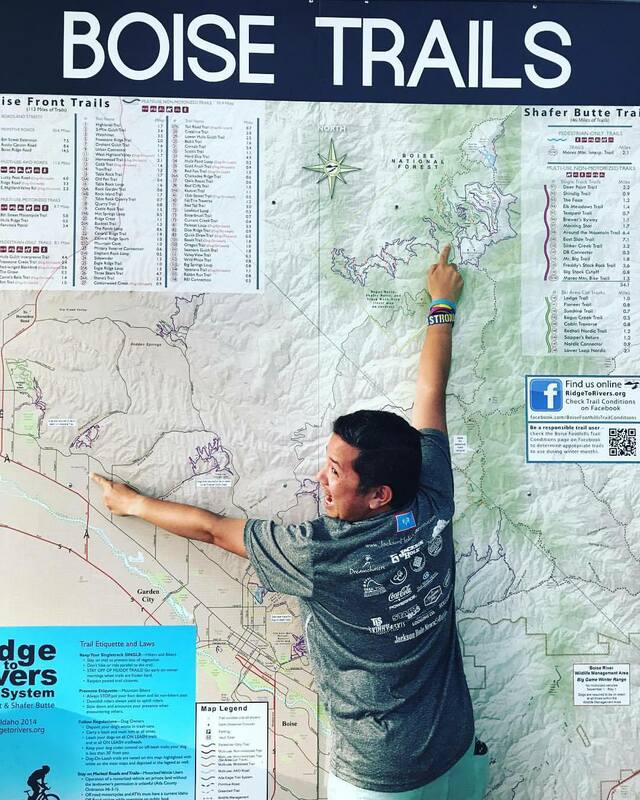 Stretching 14 miles long, 1 mile wide, and more than 3,600 feet deep, the panoramic views of crested buttes, rugged crags, and deep valley gorges is unlike any other. The scenery and vivid colors of the canyon (Waimea is Hawaiian for "reddish water," a reference to the erosion of the canyon's red soil) seem to change as clouds roll in and out, and as the sun shines through into the chasm. 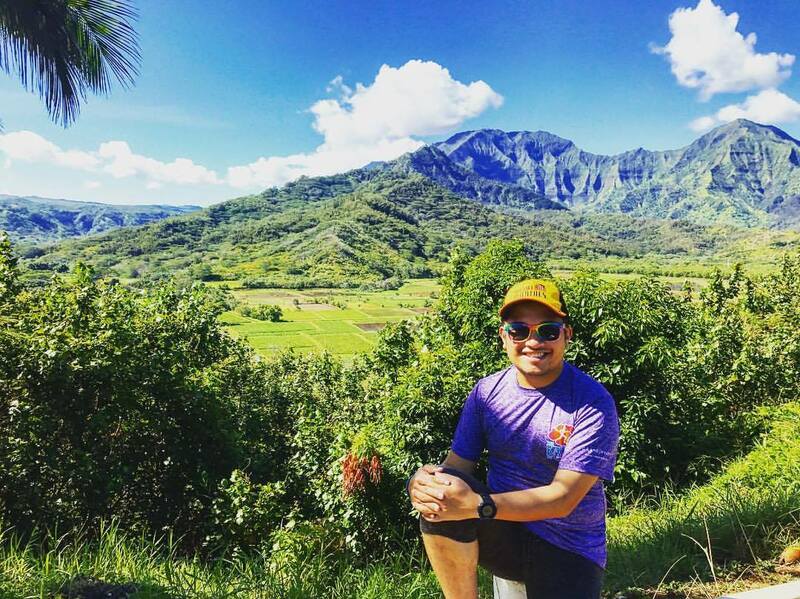 Kauai, the oldest of the Hawaiian islands, sits on top of an enormous dormant volcano with lava flows that formed the island over 5 million years ago. 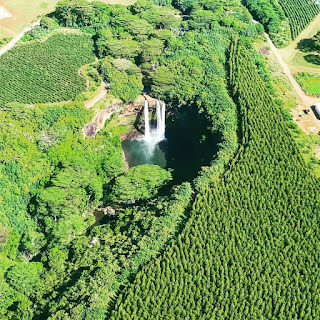 The canyon is a result of a collapse of the island that occurred 4 million years ago, and over time, rainwater from the slopes of Mount Wai'ale'ale, considered one of the wettest places on earth, have eroded the canyon along the Waimea River. 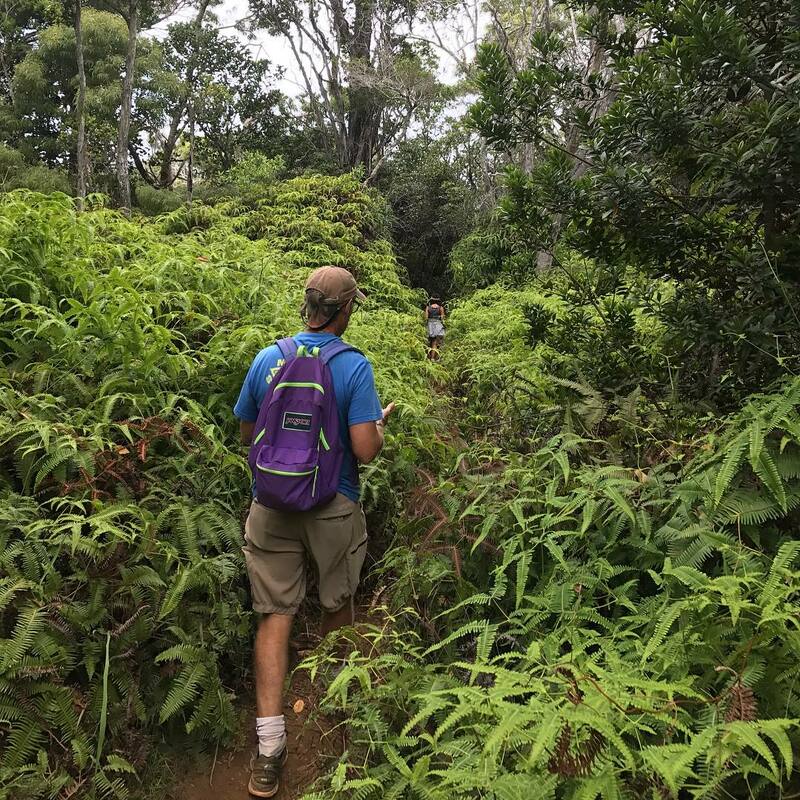 Waimea Canyon State Park and the adjacent Koke'e State Park provide a vast wilderness area with numerous hiking trails. Upon recommendation from Kamika, I decided to go on the Awa'awapuhi Trail, providing some magical views of fluted cliffs and the steep-sided Nuʻalolo and Awaʻawapuhi Valleys plunging over 1,000 feet to the Pacific Ocean below. But to get there is a bit daunting - it requires roughly a 5k hike downhill on super slippery trails in the rainforest! I ended up joining a couple, Jack and Gabrielle, who arrived at the trailhead at roughly the same time, and we kept each other company during the tough descent out and the even tougher ascent back, over the next three hours. The elevation change was a difficult 1700 feet down and up, but the trail end, where I finally got to eat my delicious poke lunch, was absolutely beautiful. During our hike, I found out that Gabrielle's sister currently works at the same NYC city agency I used to work for, and we even overlapped when I was working there! 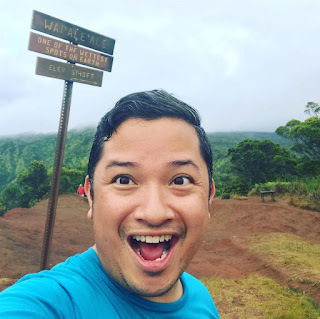 The clouds rolled back in, and to no surprise, it rained as I decided to continue north along State Route 550 to the Kalalau Lookout. 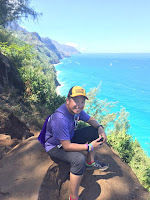 Here, I would be able to see the Kalalau Valley, and glimpse of part of the Na Pali Coast which is largely inaccessible by automobile. 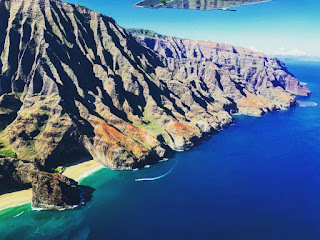 Surrounded by sheer 2,000 foot tall cliffs, the only way to get out there would be to either hike (the rather grueling 11 mile Kalalau Trail, with its trailhead starting here), kayak, or fly over it, so to the extent that I could see the coast that day was fine with me. At the absolute terminus of the road is Pu'u O Kila Lookout. 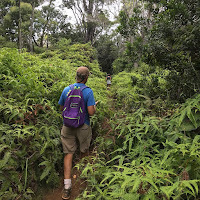 After a short hike along uneven rocks, we could see even more of the Kalalau Valley; but inland is the Alakai Swamp, the highest elevation swamp int he world. Behind that is the wettest place on earth, ending at the summit of Wai'ale'ale. Tiring myself out, and the sun beginning to make its way down the horizon, I begrudgingly made my way out of the canyon, and back toward Waimea town. The wettest place on earth, Mount Wai'ale'ale. 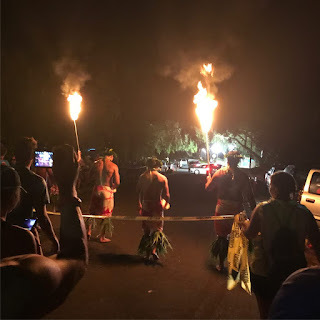 I head back to Kapa'a with the sun setting behind me, and decide to head up to the Old Town Kapa'a Art Walk, an event happening the first Saturday of every month. 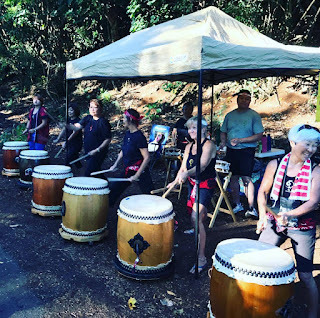 Along Kapa'a's main street, vendors line the sidewalk selling arts and crafts with some of Kauai's best musicians and bands playing in venues all around. In particular, I headed to The Local, in order to catch my old family friend Kat play the keyboards with her band - this was the first time I had seen her in likely twenty years! I was BEAT and headed back to Kamika's house to crash. 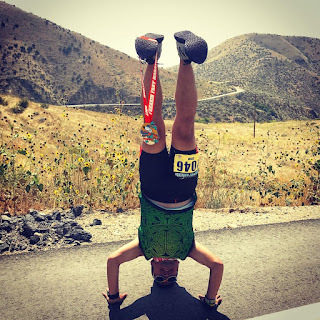 After staying awake all day with a six hour time difference and doing a grueling 6 mile hike up and down a canyon, I still had a marathon to run... the next day. It was the reason I was here in Hawaii, after all. Passing out around 9pm, I slept soundly for under 7 hours before waking up at 3:45am, so early, but the roosters were already crowing. The race was starting pretty early to beat the heat. You know I had to get this picture. 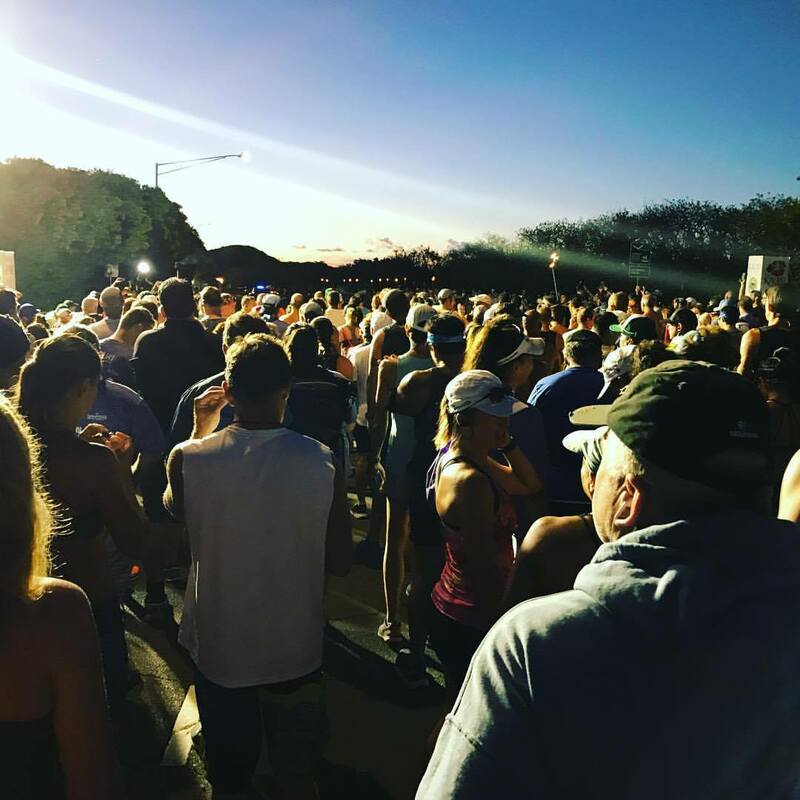 I got myself out the door by 4:15am and drove the 40 minutes down to Poipu Shopping Village, where we're directed to park, and the location of a pre-race staging area with food (fruit, breads, croissants, pastries, and coffee provide by Kauai Coffee), port-a-potties, and where we would be able to be led in some stretching before the race. Around 5:30, several locals dressed in traditional Hawaiian dress lead us to the start line on Poipu Road with torches, lighting the way. 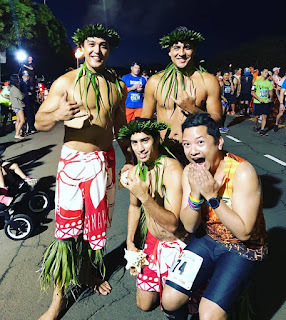 With the first Kauai Marathon champion, JT Service at the mic, he led off the morning's festivities by introducing the same locals who led us to the start reciting a Hawaiian prayer and blessing over the runners. Bart Yasso then spoke, and then I came up to do the national anthem and God Bless America. At 6am on the dot, we were off. 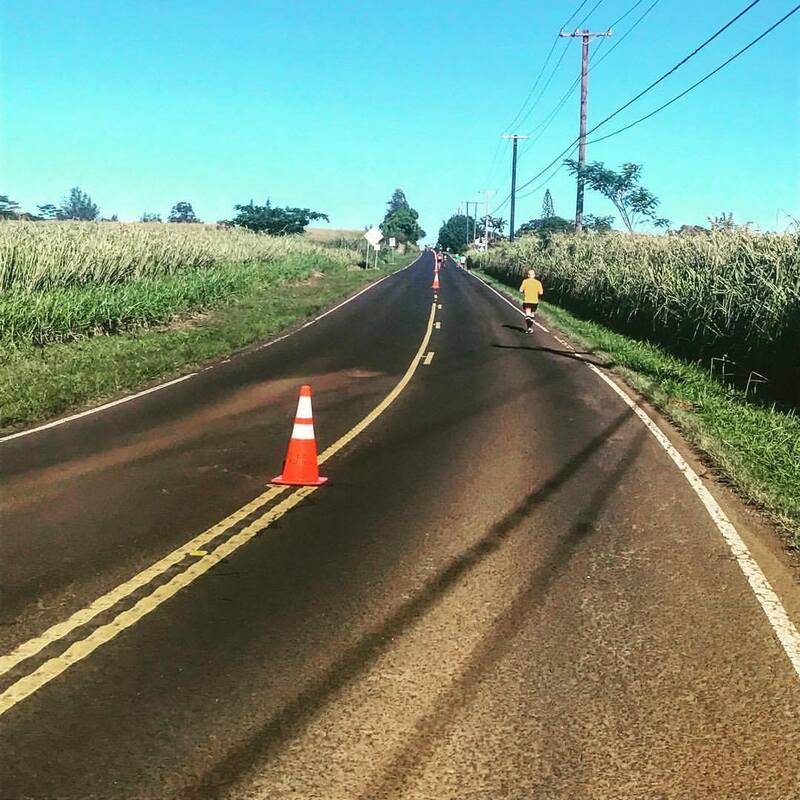 We headed southeast along Poipu Road, where we hit our first mile, then turned onto the Ala Kinoiki (Koloa Bypass), a treelined road that would lead us northward. All the while, we're gradually going uphill - every step just a little higher up than the last. Along the way, I run alongside Bart Yasso for about half a mile before he gets ahead of me. 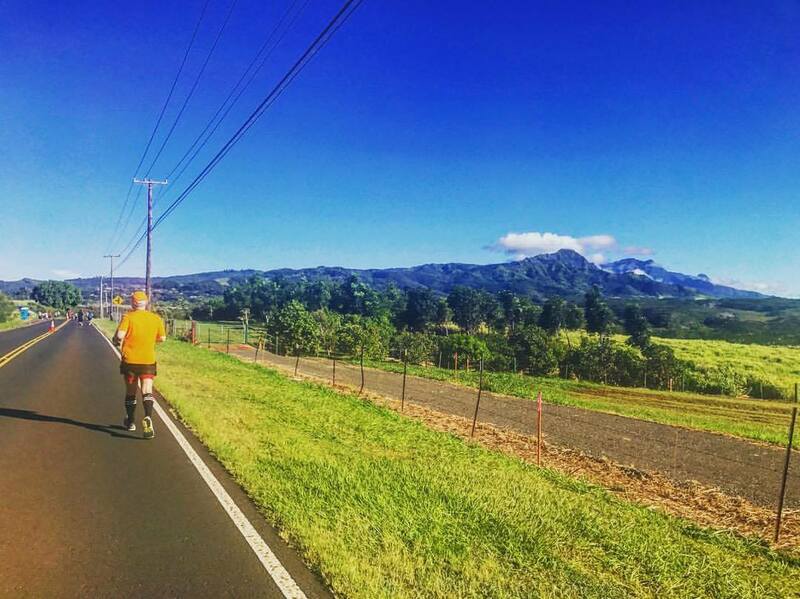 We pass around the eastern edge of Koloa town, and intersect with Maluhia Road at roughly the four mile mark. 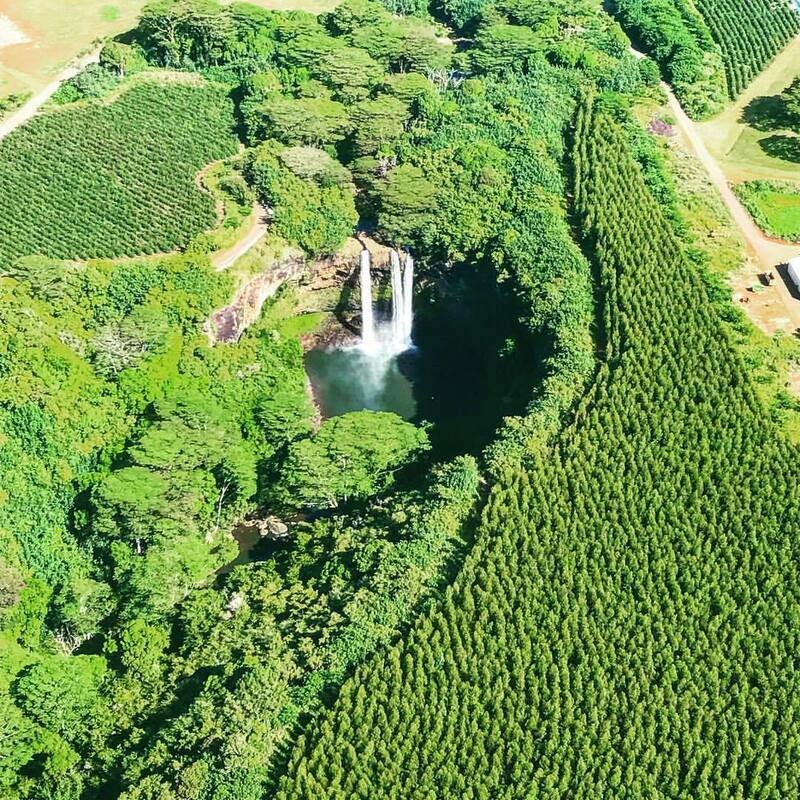 Maluhia Road is best known as being the road where Kauai's Tunnel of Trees is located, but we wouldn't get there for another two miles. From here on, it's just more rise. At that turn, we've gone from 37 feet above sea level to about 245 feet above sea level, and we're still going up. We run along the right lane of the road as we head northward - it's mostly straight with a couple slight turns. A media truck passes by on our left to take photos of us. At the 10K point, and roughly where we reach the start of the Tunnel of Trees, we've gone uphill even more - and an even more steep section of the uphill grade, as we reach 628 feet above sea level. 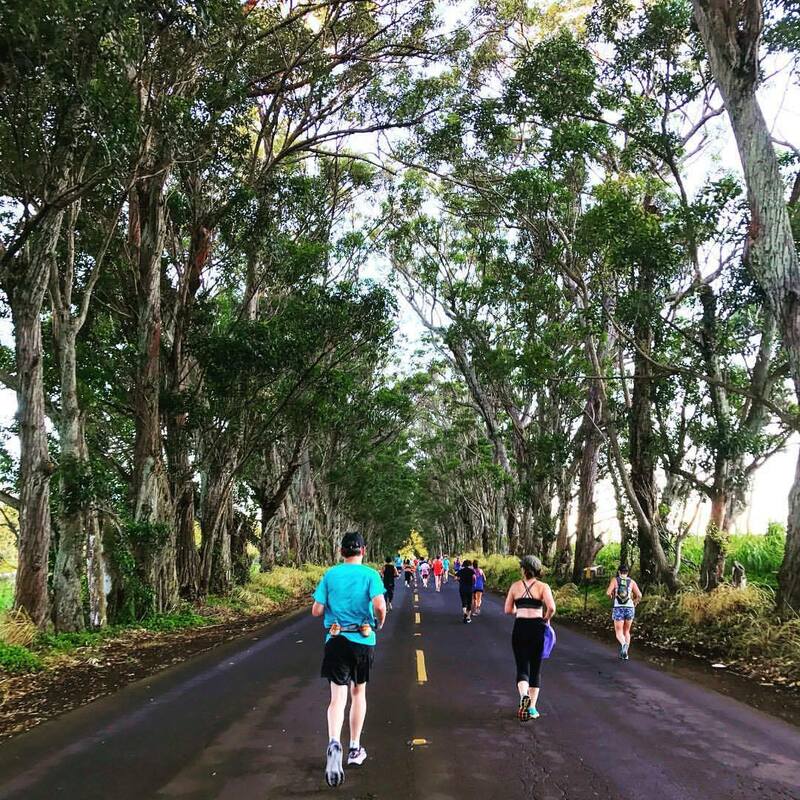 We max out at around 663 feet as we finish up the section of the Tunnel of Trees and turn left onto Hawaii Route 50, or the Kaumualii Highway. 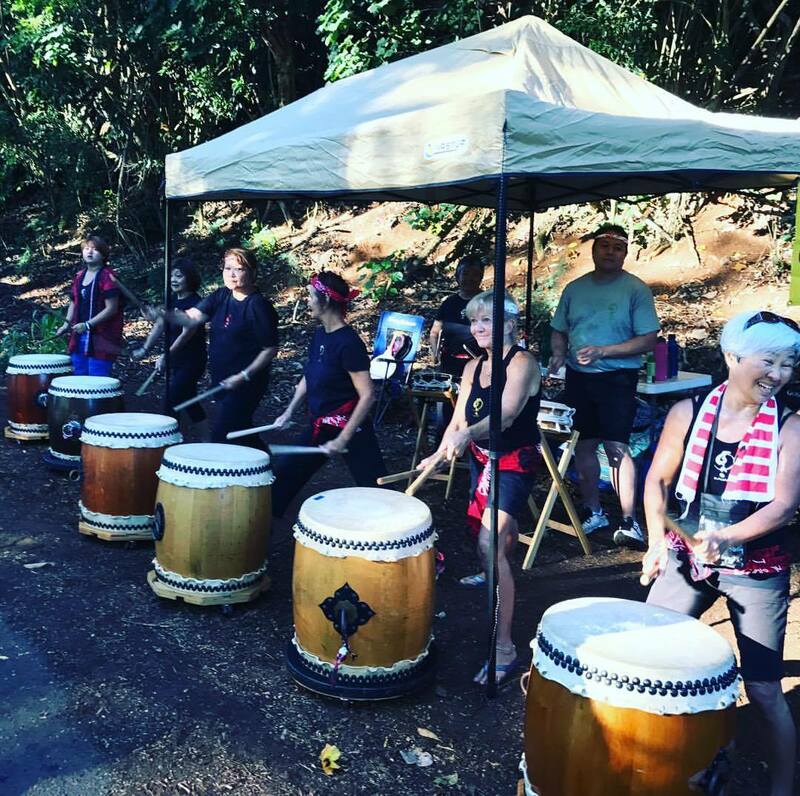 Taiko drums urging us ahead! Kauai's famous Tunnel of Trees! 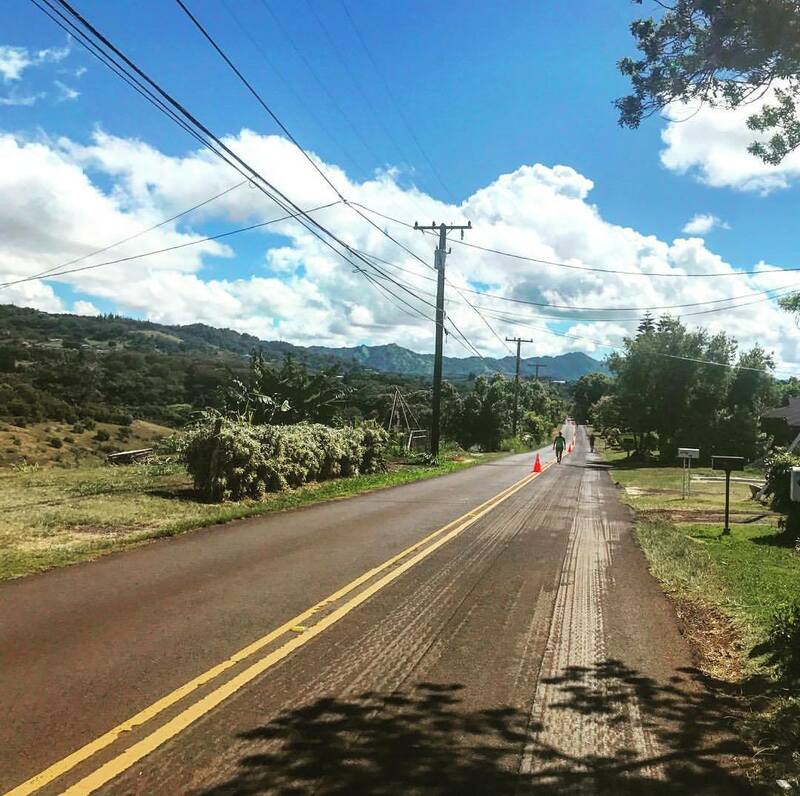 As we turn onto the Kaumualii Highway, I see to the right a long line of cars waiting to get on down the highway on one of the only roads between Lihue and Waimua - they're reduced to one lane that alternates between east and westbound traffic due to the marathon taking up the other lane. There's a slight dip in the road and we run through an area of construction where the state's Department of Transportation has been working on replacing a bridge since July. My mile split improves slightly here, before we do a tiny bit more climbing, reaching a crest of 711 feet, before a nice long downhill as we make a turn into the residential area of Omao. This marked one of my most favorite parts of the race, as most everyone was sitting in the driveways of their homes cheering on the runners as we raced by. We even had some eager horses behind their pens, running alongside us as we passed. 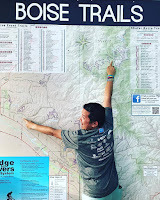 The downhill was great, as we gradually made our way down to 236 feet above sea level over the course of 3 1/4 miles - two of those miles being under 10 minutes per mile! Where to go... left or right? And then the half and full split came. As the full marathoners moved into the right lane and the half marathoners into the left, I yelled out to have them save me some beer at the end. 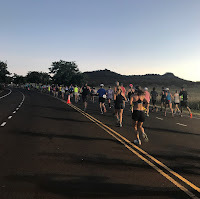 We turned right onto Koloa Road, and immediately, it was pretty lonely - only a couple runners in my line of sight in front of me, with a couple behind me. And then we began to climb, yet again. The elevation rose about sixty feet as we ran along the slight curve of the road. By this time, it around 8:15am, and I could the sun begin to exert its forceful heat onto my exposed neck. It dipped again a little bit then rose as we approached mile 12. Coming quickly in my direction was renowned marathoner Michael Wardian, running quite spritely down the road. 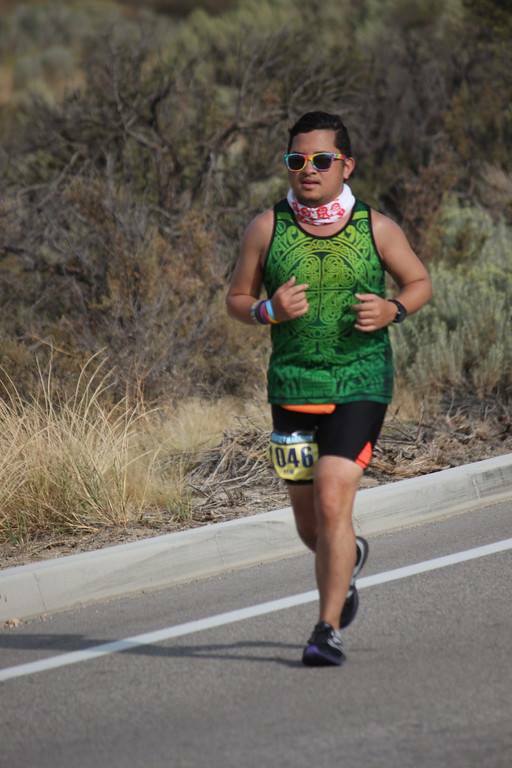 I would later calculate that I encountered him at HIS mile 23 - only 11 miles in front of me, and he would eventually win the race in a blistering 2:45. But my race had just been barely half complete. Koloa Road continued northwestward, as we passed large areas on both sides that seemingly resembled fields of corn. Were we in Hawaii? It resembled more the midwest... other than the fact that massive green mountains were just to my periphery. 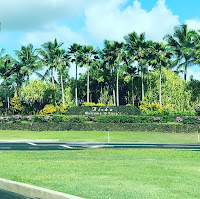 On the right were the Omao Ranch Lands, where several horses grazed in the pasture, and near the road, the flags of Hawaii and the United States waved in the breeze. Are we in Nebraska or Hawaii? I can't tell.. 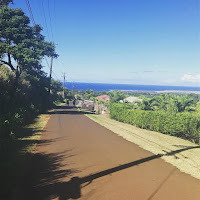 The road rose even more as we trudged our way further up Koloa Road through the residential area of Lawai. At least to our left, we had some shade trees shield us from the sun for a little bit, but that was short lived as we continued up the hill. The second marathoner overall (also the first woman) passed, followed by several men on the other side of the road. The road curved leftward, and we got a little respite from the uphill, running downhill before turning left onto Lauoho Road and a cannery/lumber distributor. We had no clue it was about to get even steeper. Lauoho Road twisted, turned, and rolled, and before long, we were at mile 15, dipping slightly as we curved our way leftward onto Waha Road, and across a single lane bridge. 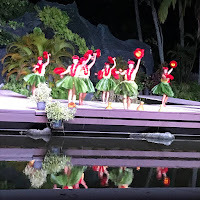 Hula dancers greeted us as we continued onward, and I took my first GU of the day. We then came upon some tough switchbacks that greeted us with some of the toughest climbs of the day - barreling toward us headed back to the finish were the second and third place female. They urged us onward, as they knew how tough that climb was. Waha Road finally straightened out, yet we continued to climb uphill. 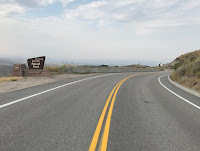 We turned right onto Papalina Road, and before long, we were reaching the highest elevation on the course at 834 feet. All along the way, residents cheering the runners on continued to encourage us, despite the tough climb. 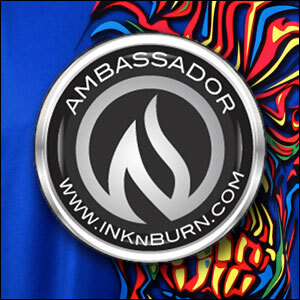 Even a little boy, who proudly exclaimed... "Hey runner! I'm four years old." Papalina Road climbed, but it eventually reached a point of topping out, and eventually, we were rewarded with a little downhill. Thankfully, it came along with a hydration stop, and some more hula dancers. We passed Puu Road and the entrance to the Kukuiolono Golf Course, where runners coming back were making their way up the road, so I knew I had a three mile loop ahead of me, essentially running around the the perimeter of the nine-hole golf course. 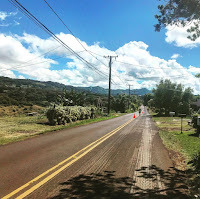 I also knew that at the residential corner of Papalina (which at this point was giving me that reward of a downhill!) and Puu in the town of Kalaheo, I would find Kat and her family at a point when I needed them the most! Kat captures me as I run by her house! And there they were, cheering me on as I came down to turn left onto Puu: Kat, her husband Dorian, and her two kids, four year old Malaika and 20 month old Marcelo. 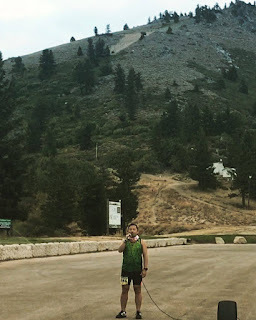 I had told them that I'd be there around 9am, roughly three hours into the race, and I showed up around 9:15, taking into account the massive hills I had to climb to get there. The stop was quick, as it was an opportunity to get photos but to also reinforce the fact that I could come back to use their shower after the race was over, and then head out to the beach for the rest of the afternoon. I left and continued on down their block, and was left to run the rest of Puu Road. Puu Road, after we made that turn into Kalaheo, would eventually give way to a downhill and curvy, but mostly rolling route that soon went from residential to wild land trail with trees and other foliage on both sides of the road. Not only that, but the road itself was jagged and uneven, so one had to really pay attention to their footing as to not step into potholes or cracks in the road that could spell for ankle problems. As we made the turn around the back edge of the golf course, we finally got to see the ocean for the first time in the whole race. At mile 17, there was an aid station where the volunteers had beer, and I took part of course, then proceeded to play a little "flip cup." I continued on along the road as it twisted and turned, but it was at mile 19 that we had a massive hill to ascend, supposedly the steepest of the entire race. It was not easy, especially with the relentless sun beating down on me, but on the other side of that hill was where the beginning of the loop around the golf course was, and from there on, I knew we were on the back portion of the race, with more downhills than uphills to conquer. 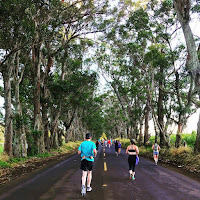 We headed back along Papalina and cruised along the downhill, turning left onto Waha Road, and curving around onto Lauoho Road; before long, we were back on the long stretch of Koloa Road that brought us all the way back to where the marathon and half marathon split so many hours before. At this point, we had completed 24 miles of the race, and we made the right turn onto Ala Kalanikaumaka, otherwise known as the Kukuiula bypass road. We encountered another tough hill, but at the top was a DJ playing some house music that at least pushed us as we made our way to the top. These last two miles were tough, as the sun was really beating down... we passed the fairly new Shops at Kukui'ula shopping village, and passed the last aid station, providing cold towels (which I could've used maybe 13 miles ago!) 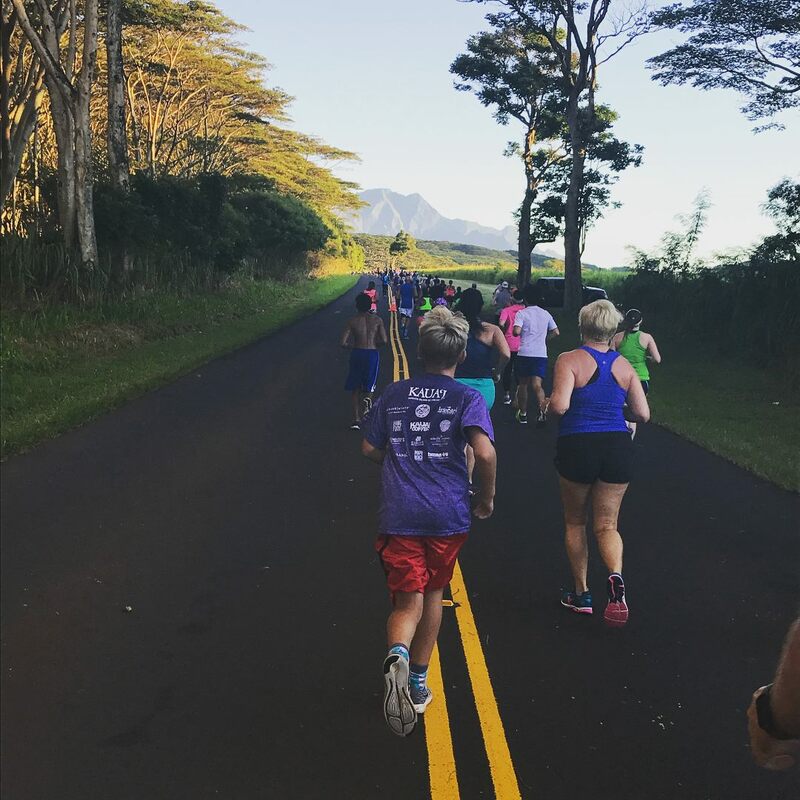 We made our way around the edge of the roundabout near Poipu Road, and found our way down Hoonani Road beelining right to the water's edge, where the finish line was waiting! 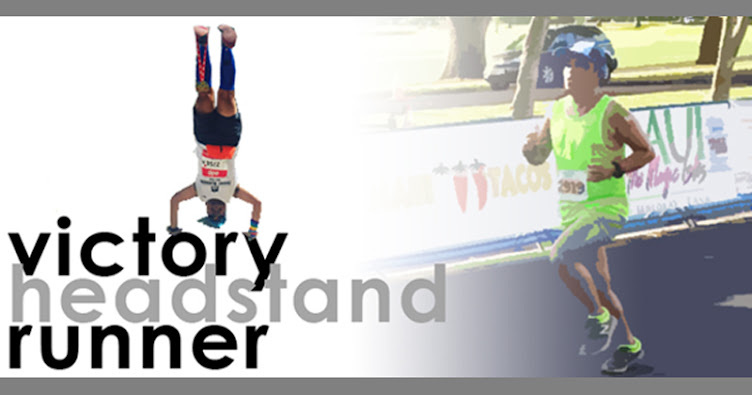 I crossed the finish mat in 5:21:32 - a time I was pretty happy with considering the high heat and humidity, and the many hills I had to conquer! Waiting for me at the finish were my friends Lisa and Lidia, and a new friend Mary, all of whom had finished the half - it was very sweet for them to stick around to cheer me in! After cooling down a bit, I took the shuttle back to my car, and headed back to Kat and Dorian's house for a much needed shower; we all headed out for some beach time on the south shore, on the family beach located at Salt Pond Park. The surf was pretty strong that day, with swells overpowering the rock shelf that defined the safe swimming area, so we gingerly got in and made sure we didn't get too far out. We also brought some much needed food from a nearby ramen place to share amongst the five of us, to just re-up my energy! We drove back to Kat and Dorian's to freshen up, and I headed back to Poipu to join the Kauai Marathon Staff and Sponsor After Party at the beautiful new Koloa Landing resort, which sponsored the post-race festivities after the finish line. After the catered dinner, I headed back to Kamika's place for much needed rest. Kamika had just returned from California after running the Disneyland Half Marathon weekend in Anaheim, so we got to chat and decide on the activities we'd take on for the following day (Labor Day), as Kamika didn't have to work until that evening for the luau. 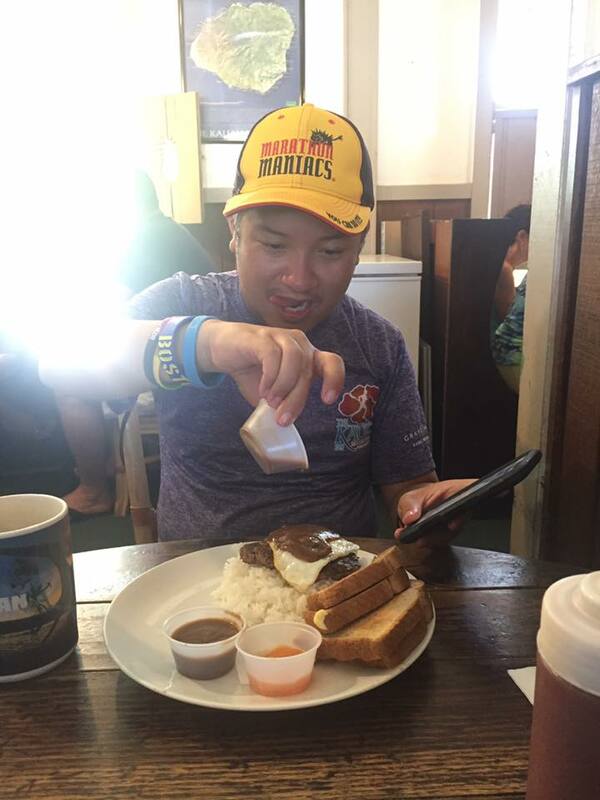 Getting to sleep in on Monday was a luxury - with Kamika driving, we headed up to Kapaa for breakfast at Ono Family Restaurant and had a delicious meal of loco moco - hamburger patty, gravy, and egg with a side of rice... and of course some delicious Kauai-made coffee. We then took off for the eastern and northern coasts of the island, ultimately headed to Ke'e Beach at the end of the Kuhio Highway. 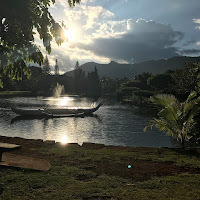 Along the beautiful road trip there, we stopped in Kamika's mother's family's hometown of Anahola, stopped on the side of the road for a sweeping view of the beautiful Hanalei Valley, and took in the peaceful views of Hanalei Bay and Hanalei Pier. 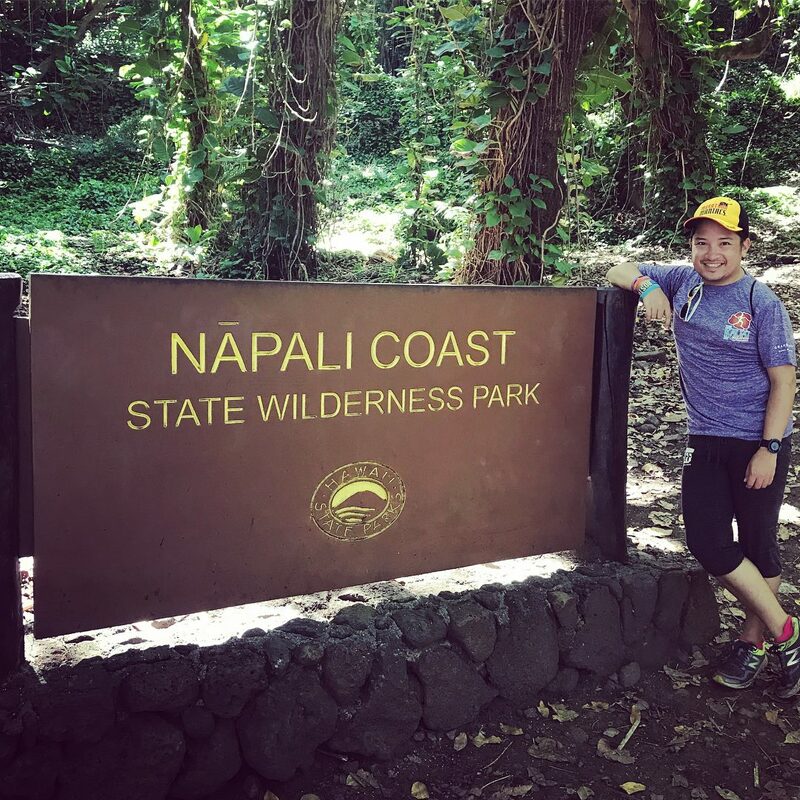 We lucked out in finding nearby parking at the PACKED Ke'e Beach, and then set out for a short half mile out-and-back hike along the Kalalau Trail (the other end, not from the side I saw my first day out from Kalalau Lookout at Koke'e State Park) headed out toward Hanakapi'ai Falls, but only get to the lookout where you can see the Na Pali Coast - I mean, we're both exhausted from our respective races, so this was at least a nice way to get the legs moving again. The half mile hike up was tough... nearly 600 feet of elevation gain to the top, which meant having to go back down it... and not an easy task, as the path was kind of slippery. 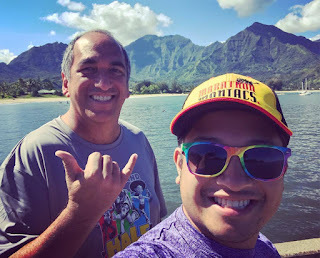 We did the whole thing in about an hour, and then proceeded straight to the beach to eat our lunch that Kamika stopped to get in Hanalei (poke, of course!) and then have a swim in the warm ocean. 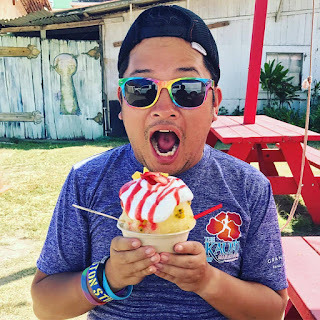 We ended the afternoon by making stops at the Kilauea Lighthouse for photos from the observation platform (the lighthouse was closed), and then more food at Chicken in a Barrel and Wailua Shave Ice, both in Kapa'a. 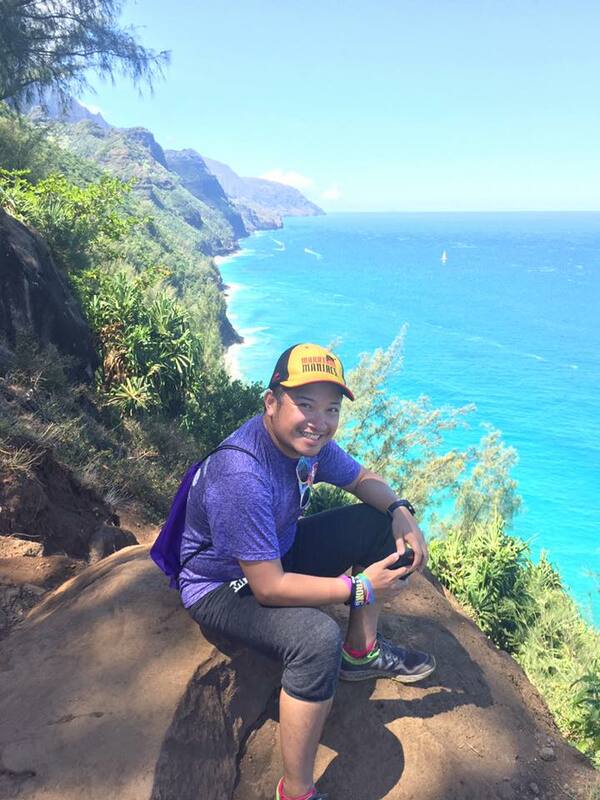 The second of three times I'd be able to see the Na'Pali Coast this trip! Wailua Shave Ice! Needed with this heat and humidity! 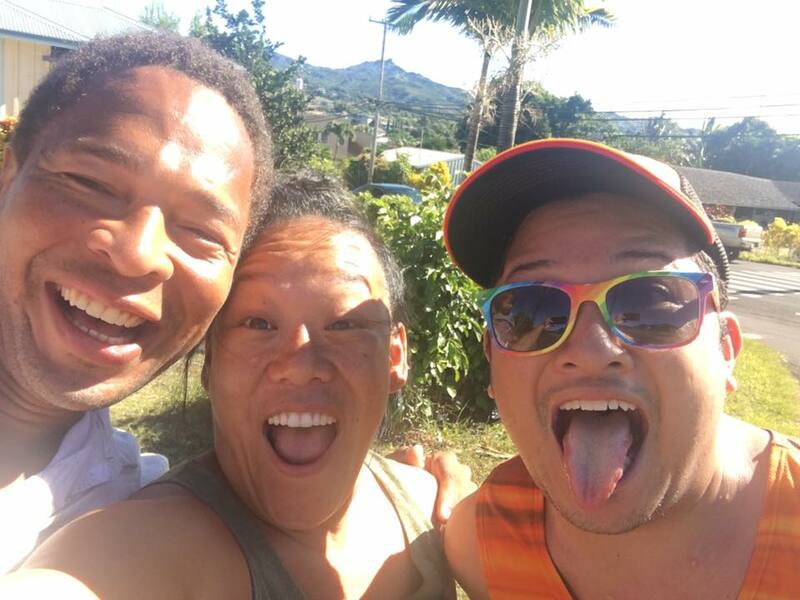 We got back to Kamika's house with some time for him to get ready and head out to his family's gardens to prepare for that night's luau. 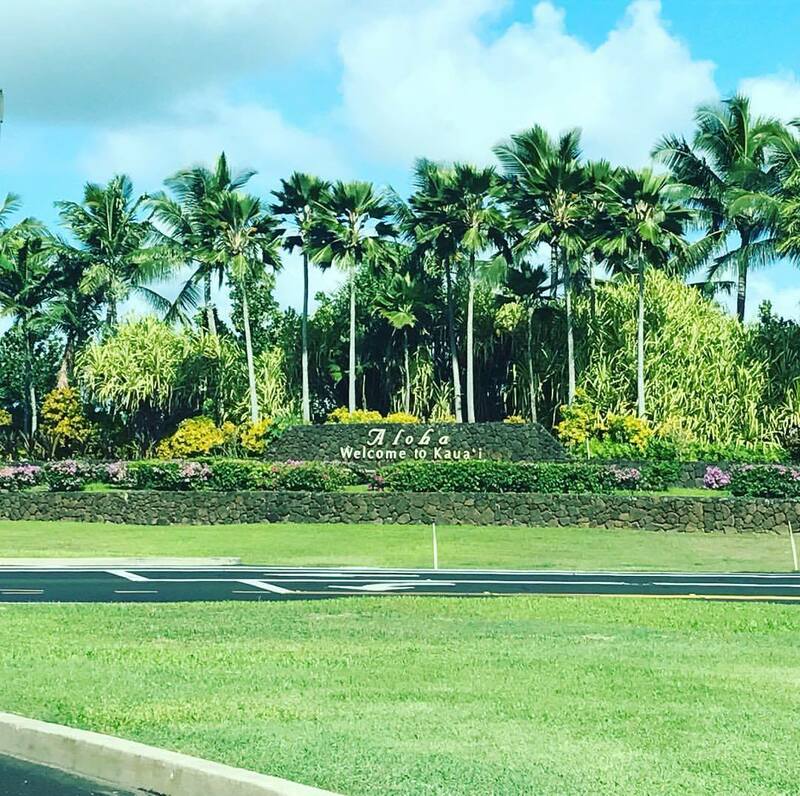 I followed about an hour later, enjoying the beautifully manicured botanical and cultural gardens, 30 acres in all, in the Wailua River Valley. 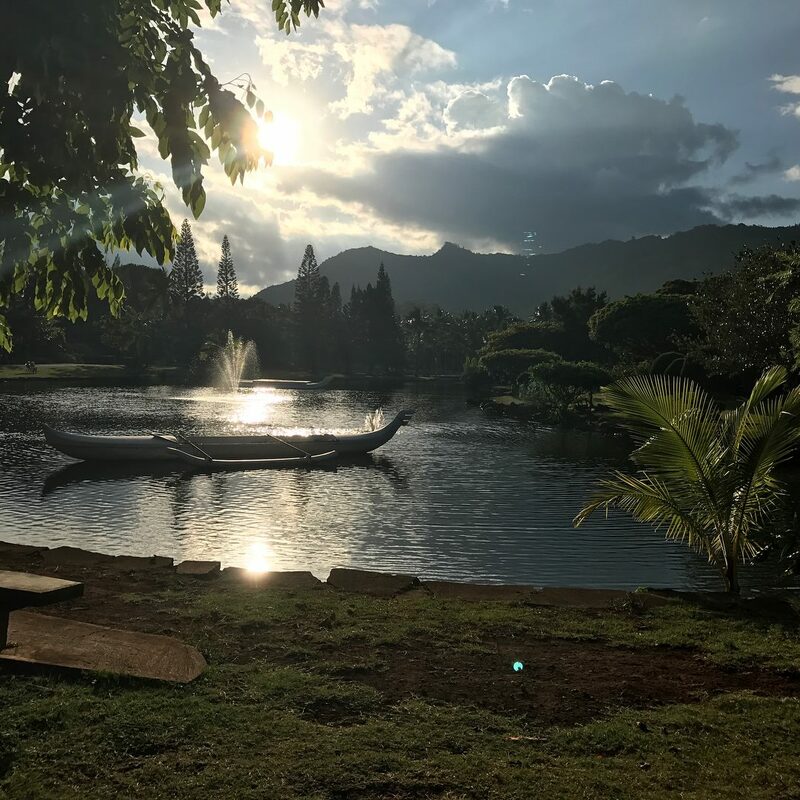 Kamika's grandfather started their family business fifty years ago, and here they offer garden tours, boat tours along the Wailua River, and of course their famous luau. They also offer opportunities to rent out parts of the gardens for weddings and vow renewals. The gardens were just stunningly beautiful. Visitors can view over twenty types of fruit in the Tropical Orchard including breadfruit, star fruit, jackfruit, macadamia nuts and soursop; wander the Bamboo and Fruit forests or enjoy the colorful attraction of the Flower Wheel and Flowering Tropicals areas. I got there a little early to wander the gardens and also get on board the narrated tram tour, before observing the imu ceremony, where the kalua pig, wrapped in ti leaves and placed in the underground imu oven, is removed after nine hours of cooking. We headed over for the main event... the luau feast! 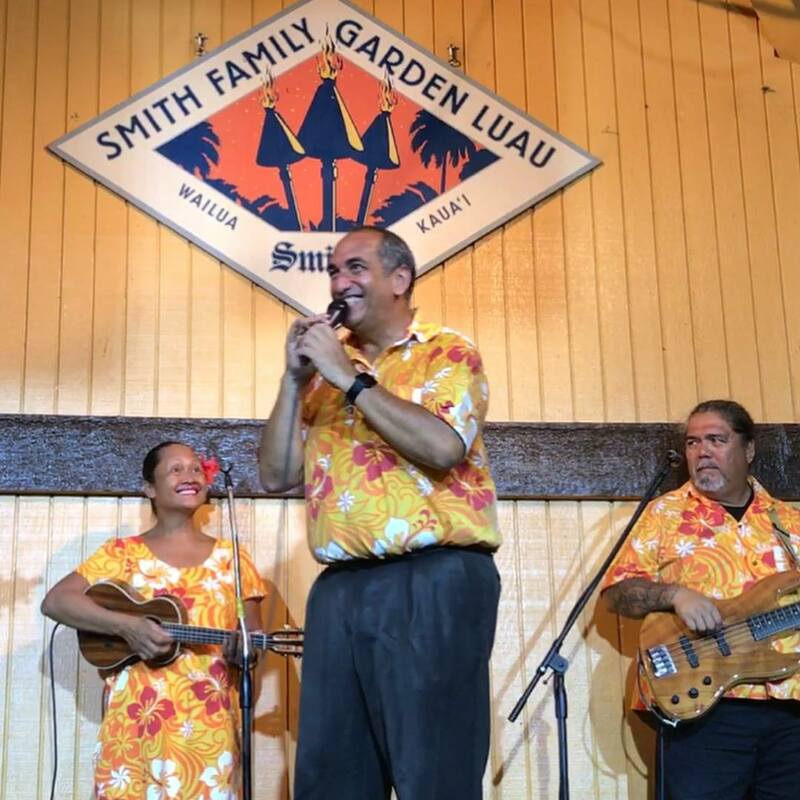 and positioned myself squarely in front of the stage, where Kamika would be emceeing the dinner entertainment, which included him singing some classics (like Elvis Presley's "Can't Help Falling In Love") and Hawaiian songs, backed by a three piece band. I consumed a few mai tais along with a dish full of kalua pork, beef teriyaki, chicken adobo, sweet’n’sour mahimahi, lomi-lomi salmon, fresh poi, Hawaiian sweet potato, mac salad, namasu salad and scrumptious tropical desserts! And Kamika even got me up on stage to join in on the audience participation component of the night, where I learned a hula. All the food, then doing the hula made my stomach churn. LOL. 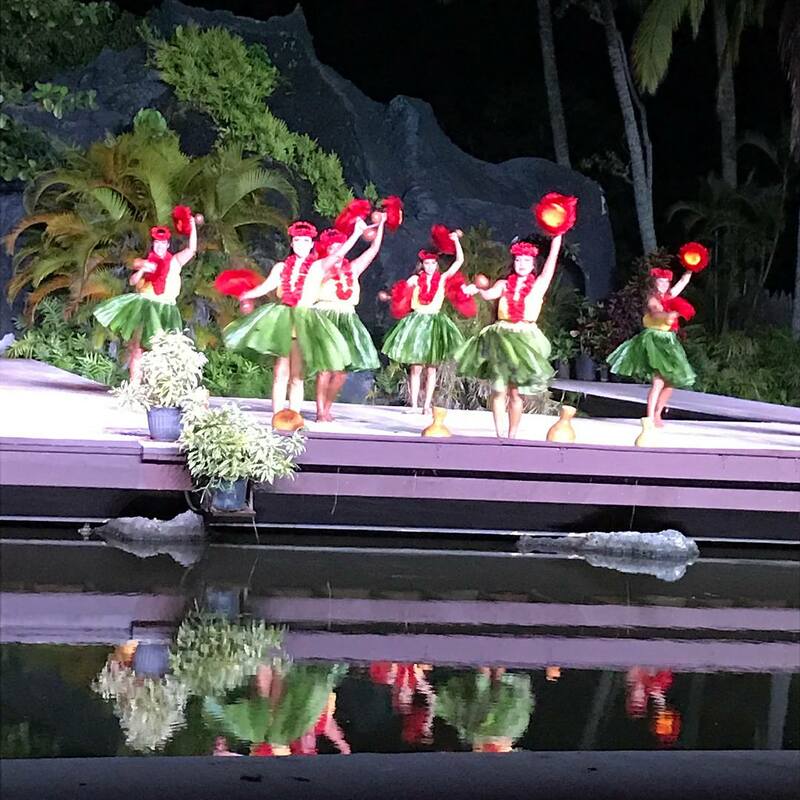 Afterward, we headed over to the Pele Amphitheatre, where we were entertained by the "Rhythm of Aloha Show," showcasing colorful and authentic performances from Hawaii, Tahiti, Samoa, Philippines, New Zealand, China and Japan. I returned back to Kamika's place well fed and ready to turn in for my last night's sleep in beautiful Kauai. The Na Pali coast in all its spelndor! 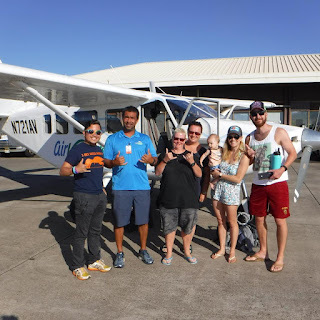 Our small group posing in front of the plane we just rode! What a view from above!